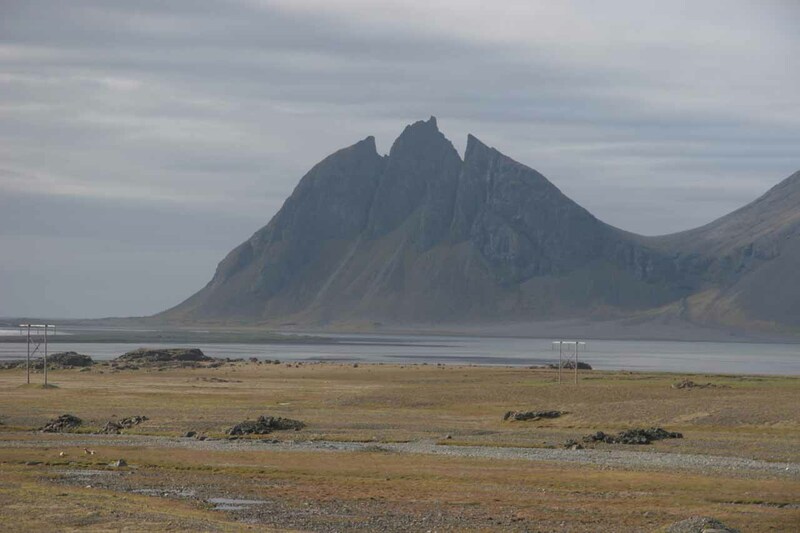 As planned, we awoke at 4:45am in anticipation for our long haul from Egilsstaðir to Skaftafell. We awoke to cloudy skies, which contrasted sharply from the nice weather we had been enjoying for the past three days. I figured of all the days we had to have bad weather, we mind as well have it be our travel day. Without further adieu, we were off at 5:30am and headed south on the Ring Road. 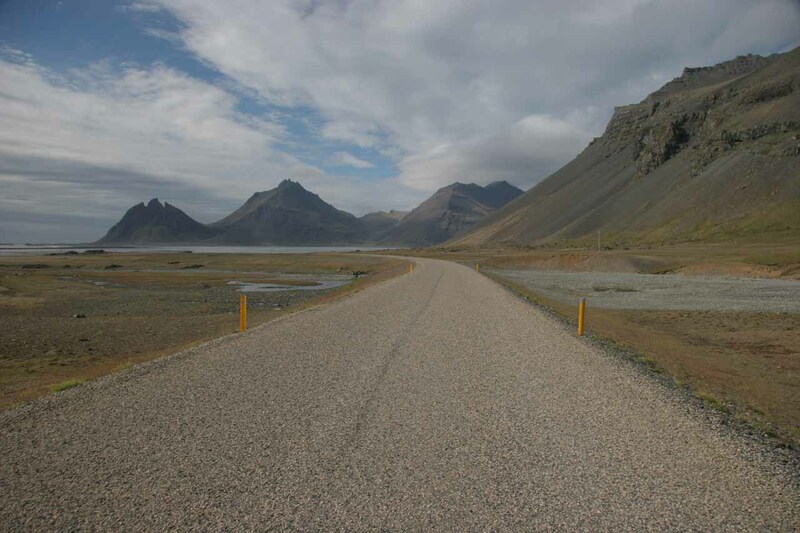 We initially thought it would be smooth sailing because it was on the most used road in the country, but the Eastfjords were littered with alternating sequences of paved then bumpy unpaved roads. We actually had to make a decision at one point to take either the 939 or stay on the 1 (i.e. the Ring Road). The 939 would’ve taken us to back to the Ring Road in a very short shortcut going over a pass but it involved a 17% grade according to a sign. 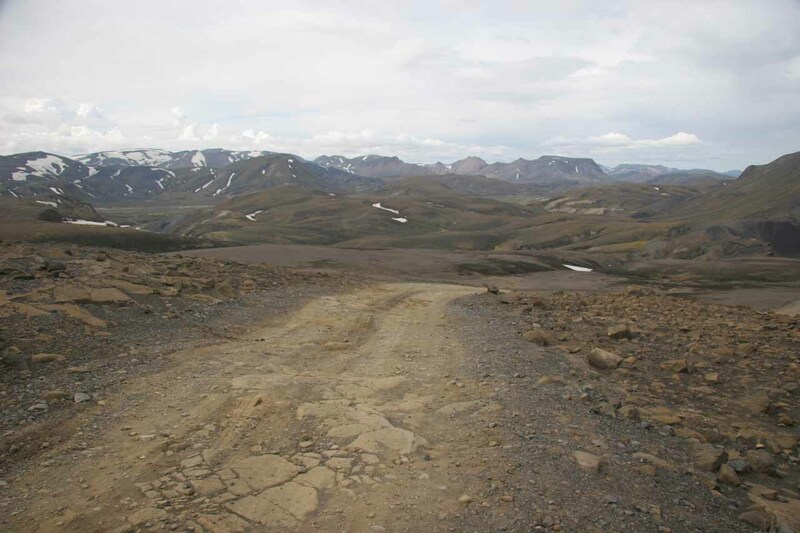 The Ring Road was also unsealed as it traversed a different pass with a 12% grade. We figured it would be safer to take the long way around and not risk sliding on a gravel road with a steep grade (though I’m sure we could’ve made it). Better safe than sorry, I reckoned. 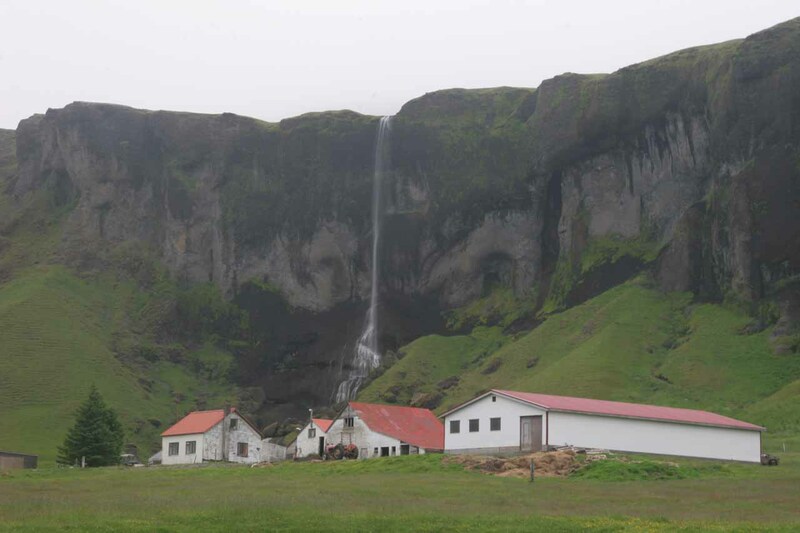 And so we continued to weave in and out of other fjords on Iceland’s east coast. There were numerous times where sheep would be picking at something on the road so we had to wait for them to get out of the way before moving forward. There were also numerous farms that looked either dilapidated or abandoned. We could tell whether a farm was abandoned or not by whether it had a car that looked like it was in driving shape. In any case, it was evident how poor this area was and I’d bet many of the sheep out here belonged to abandoned farms that have since reproduced and wreaked havoc on the country’s depleted soil. 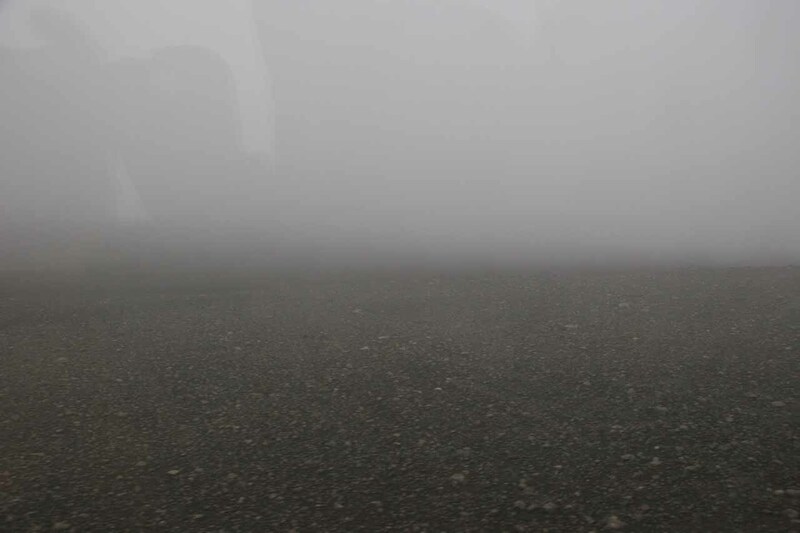 The drive was mostly featureless under the dreary weather. I’m sure under different circumstances, there would probably be more reasons to stop and take in the scenery. 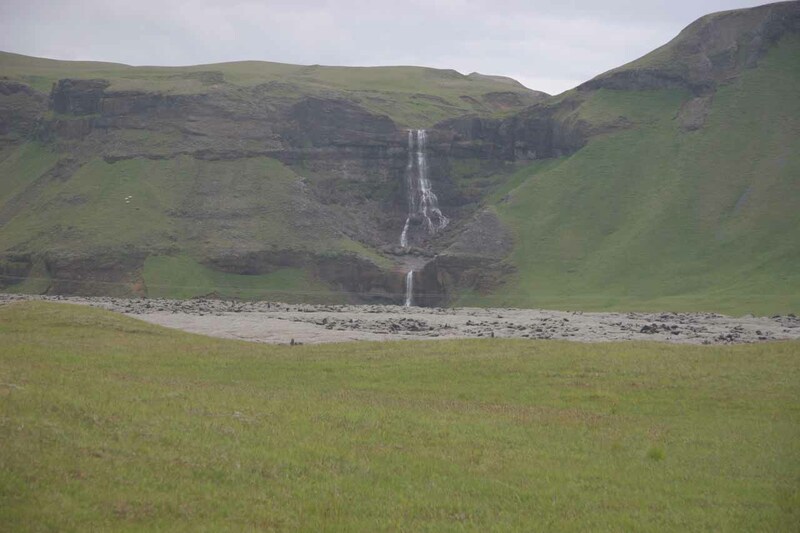 There was however, a noticeable waterfall near an area called Hamar, which we started to make a short detour to get closer at around 7:40am. Unfortunately, it was on private land and we couldn’t get close to it. 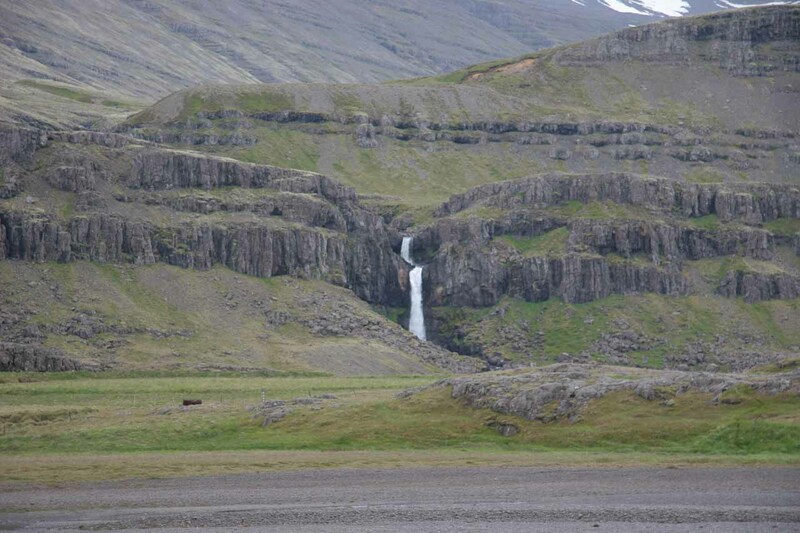 So we settled for distant views of that waterfall from across a river. Little did we know it was the most significant waterfall (and probably the only one) we would stop for on this leg of the trip. This was despite the fact there were numerous smaller and ephemeral ones. I guess my mind was a bit too much on getting to our next destination thinking the drive would take all day. At around 8:40am, I started to notice a strange-looking mountain. It had three sharp peaks but they tapered off in a way that looked like wings. 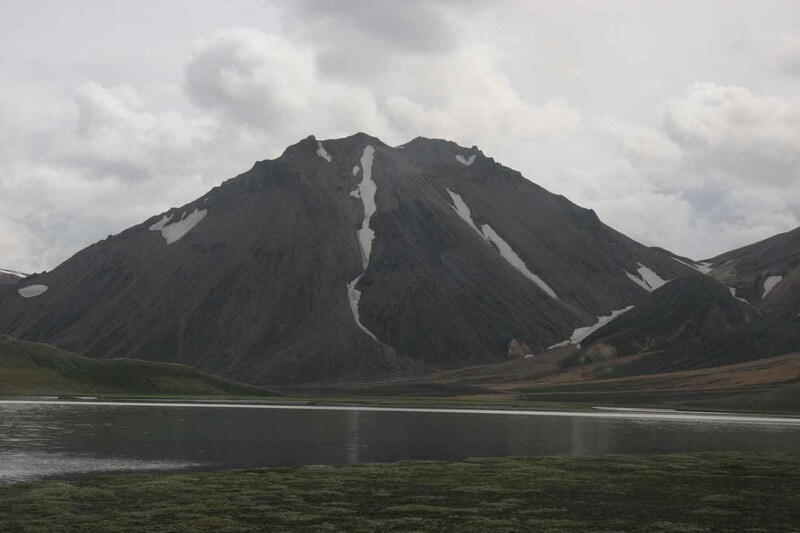 I wondered if this was the Batman Mountain I had read about during my trip research while browsing pictures on Flickr. Stops were few and far between to this point on the drive so we pulled over the paved road and took our photos before moving on. Not long thereafter, we went through a somewhat short tunnel and immediately were greeted by the sight of glaciers in the distance. 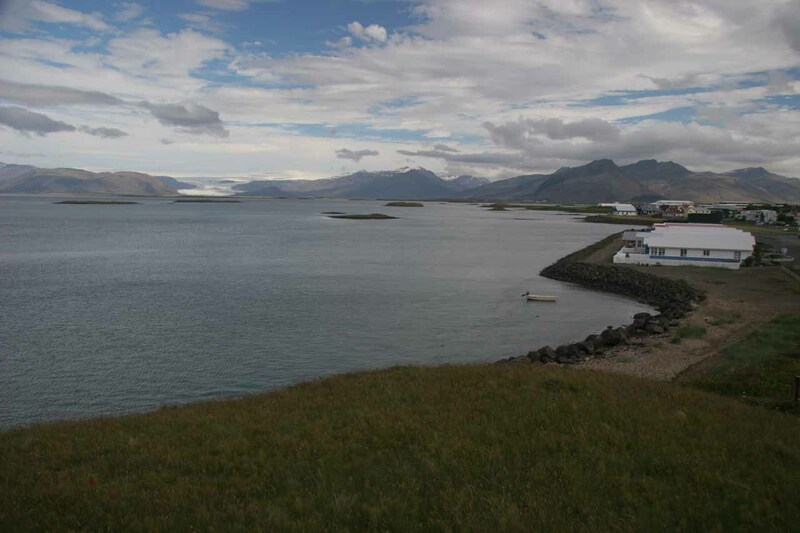 It wasn’t long thereafter that we filled up gas at the quiet bayside town of Höfn (pronounced like “hup”) and took a few glacier photos from afar. We stopped at a scenic bluff near the southwestern end of town. It was still chilly due to the overcast skies and once again the winds were blowing. 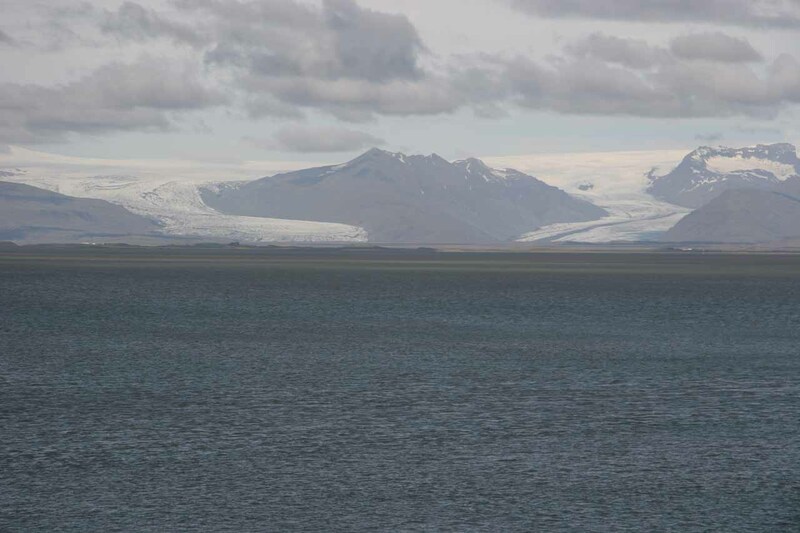 Even though the glaciers were far away across the bay to the north, we could still sense how big they were. 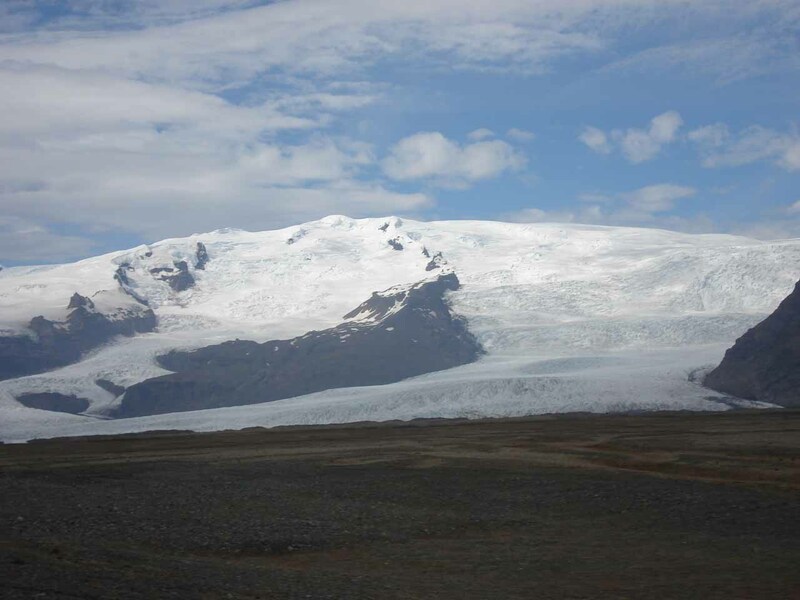 From this vantage point, we knew we can see more of the glacier than we did if we went up to their terminus. Since it was still quite early in the morning at 9am, the town was still sleepy and quiet. So after taking our photos from the bluff at the far end of town, we decided not to linger here much longer. 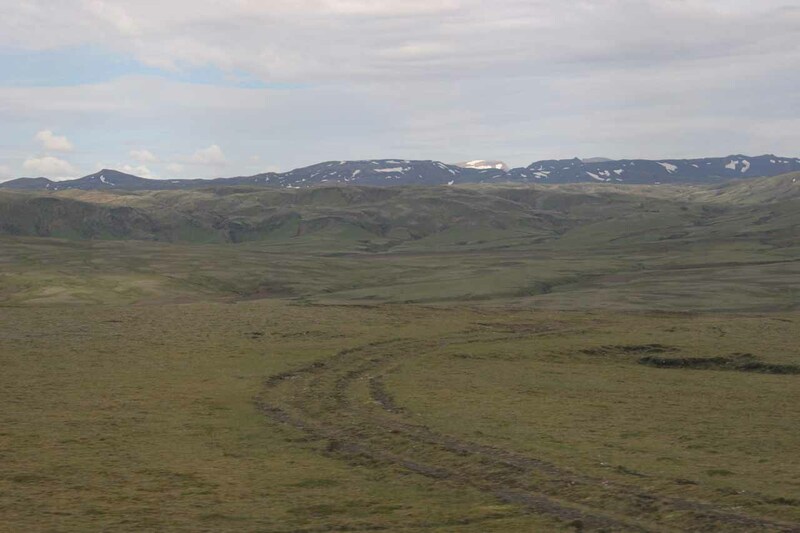 By 9:15am, we continued driving along a long desolate expanse of black-graveled plains undoubtedly scoured by glacial action. One valley after another and one single-lane bridged over glacial rivers after another, there were always glacier tongues in sight as we traversed the plains full of sandurs (sands). 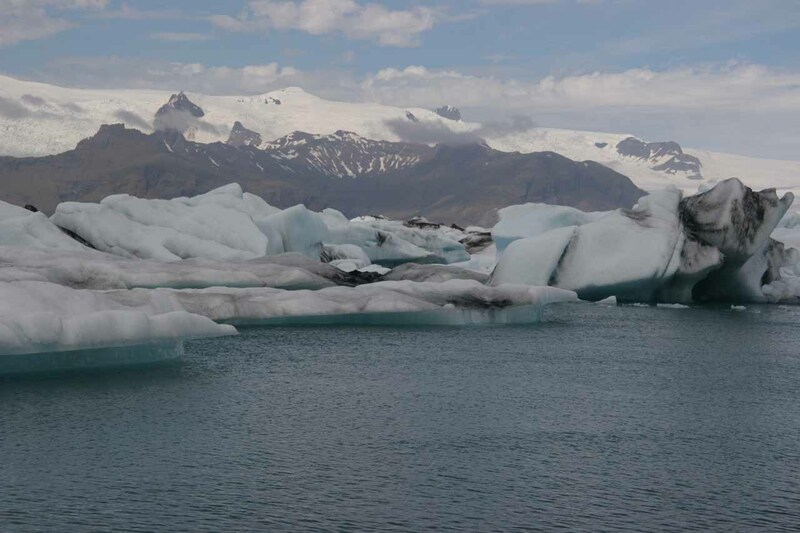 All of these glaciers were in fact extensions of the vast glacier Vatnajökull, which is said to be the largest glacier in the world outside the Arctic and Antarctic Circles. 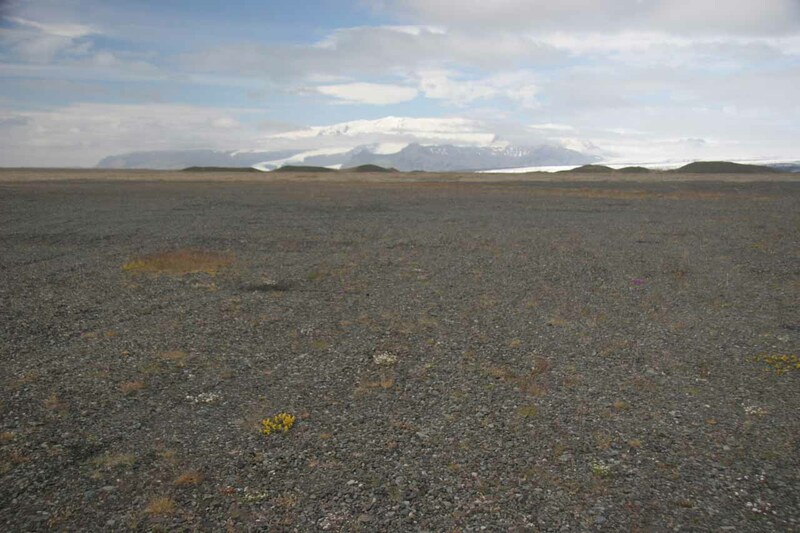 The immensity of the desolation within the glaciated plains was something we had never experienced before on this scale, and it was truly a treat to drive through. Some of the signage and literature here stated that the glacier once stretched directly into the Atlantic in many spots, but that the contribution and expansion of the glacial sands had more to do with glacial floods and residual deposits than retreating ice (though with Global Warming, I’m wondering how much more amplified this effect has become). 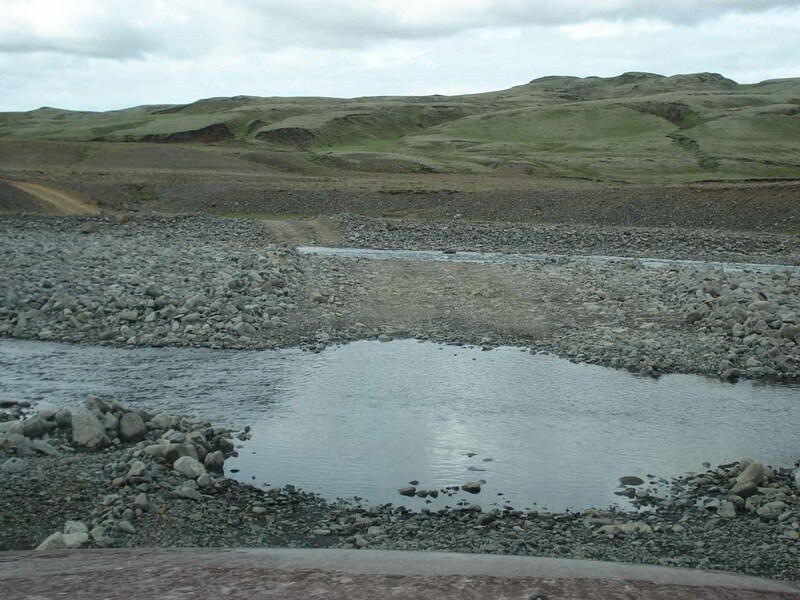 In any case, it wasn’t until 1972-1974 that bridges started to be built to finally cross some of these glacial rivers, and perhaps that might have explained why the East of Iceland was as quiet and as remote as we had noticed it during the drive today. It simply wasn’t as accessible until recently. 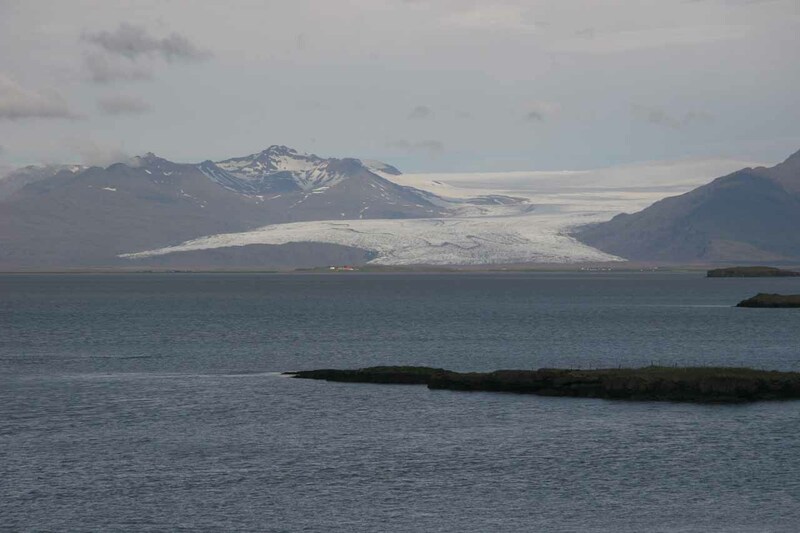 At 10:20am, we noticed a car park and some commotion that turned out to be the glacier lagoon known as Jökulsárlón. This was an attraction that Julie noticed in a random brochure or pamphlet during our trip, and ever since then, she was anticipating seeing it. Apparently, this area had also appeared in a James Bond movie as well as in Tomb Raider. 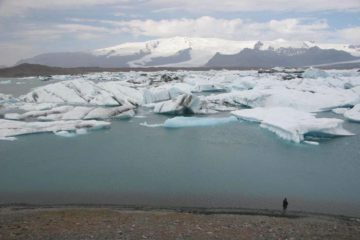 But despite where this place might have shown up in the literature, the lagoon of icebergs and melting ice drifting along towards the black-sand beach and awaiting ocean waves were truly something to behold. 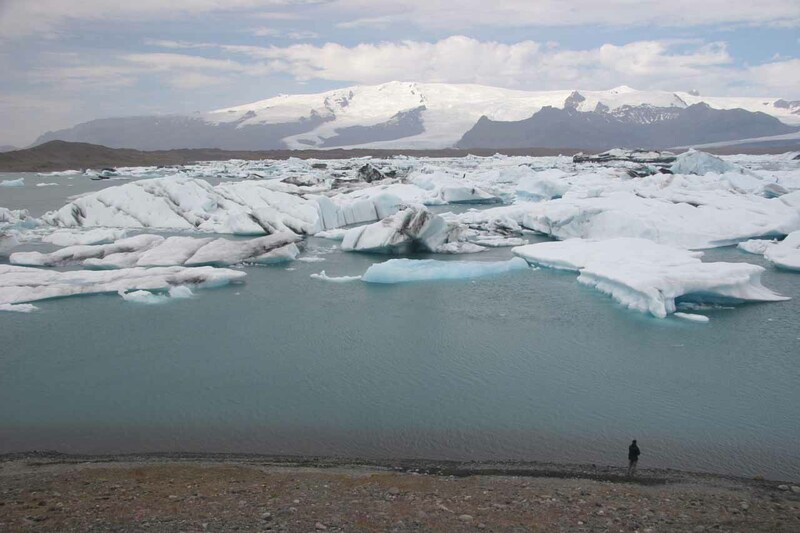 Behind the loose ice pieces and bluish ice were intact glaciers clinging to mountains in the background. Of course this was a very popular stop for tourists so there were many other people around here. There were even amphibious boat tours to get closer looks from within the lagoon, which we opted not to do. I couldn’t help but think about how much this lagoon must’ve grown since the advent of Global Warming. 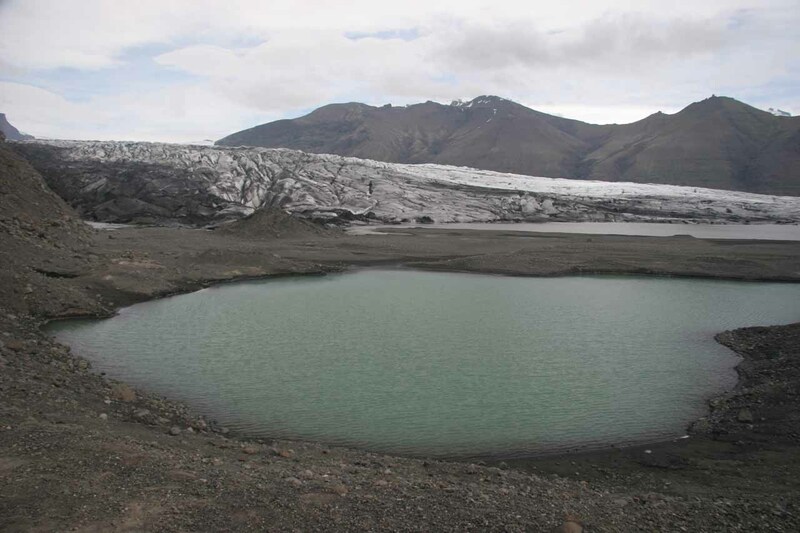 I’ve read in the literature that this lagoon actually started growing since the advent of the Industrial Revolution. I’m sure this whole area will become a lagoon in the not-so-distant future. We left Jökulsárlón at 11:15am. 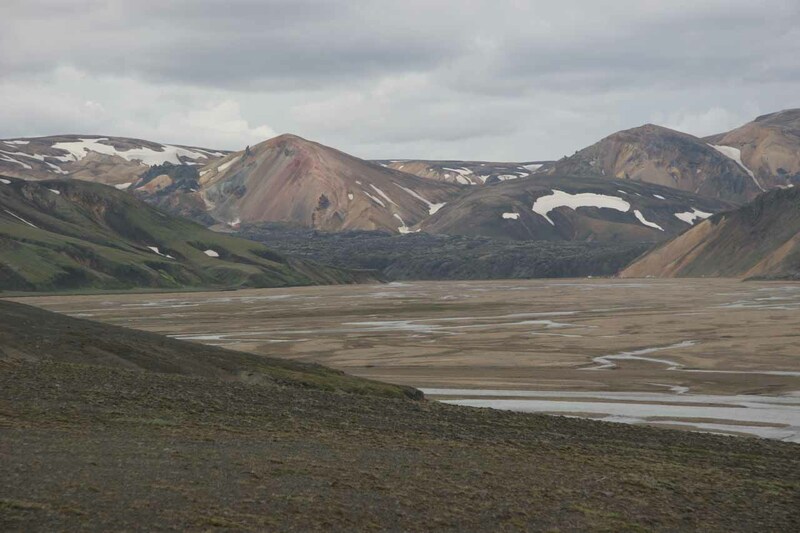 The next part of the drive continued through more sandurs as we passed through yet more desolate tracts of vast black sandscapes with a few of the glacier tongues visible from the road. 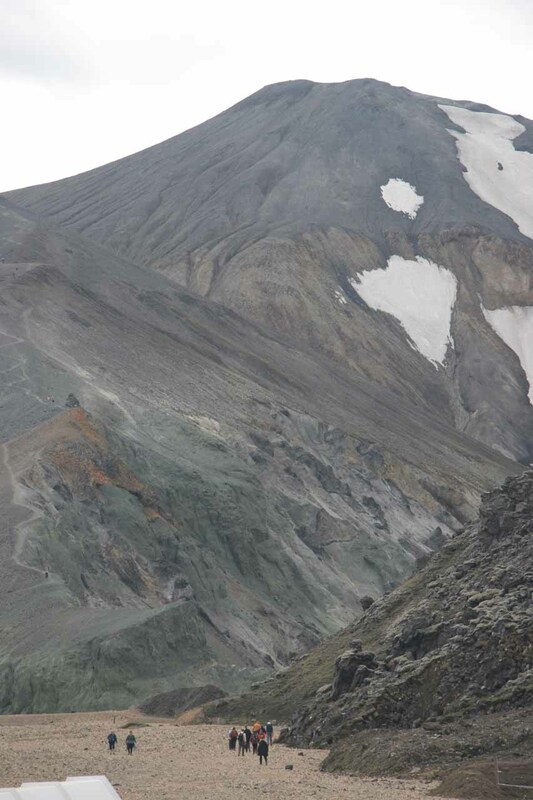 We didn’t stop for any of these glacier tongues as it didn’t take long before we started to get glaciered out. 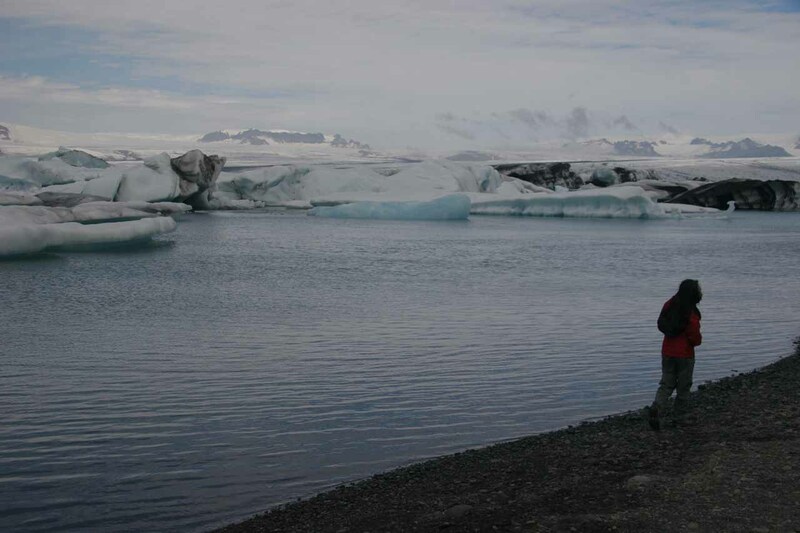 But at least we knew that the experience of Jökulsárlón was quite satisfying to say the least. 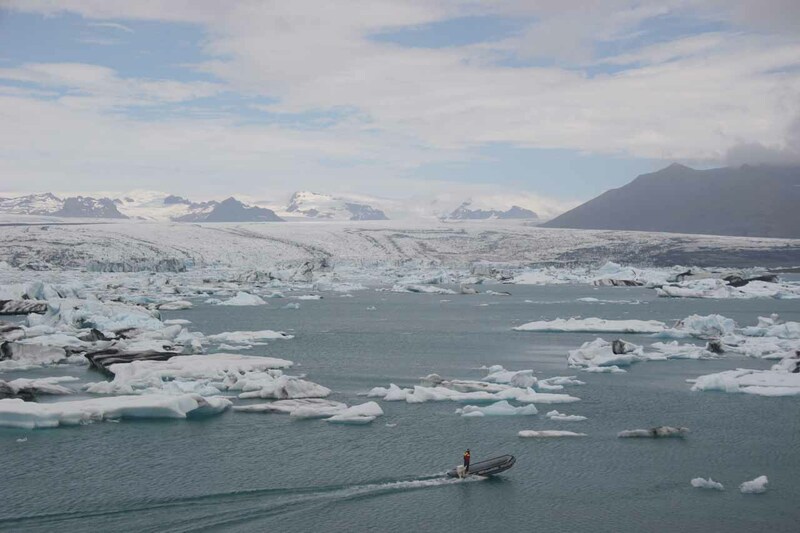 Still, it was hard to fathom how getting this close to many of the glaciers once seemed so difficult and out-of-reach in many instances (I recalled we hiked to a glacier terminus in Norway). And yet here, they seemed to be a dime-a-dozen. We eventually got to the Hotel Skaftafell at 12:30pm, but it was too early to check in. So we had ourselves a lunch of truck-stop-type food, which was affordable by Icelandic standards. 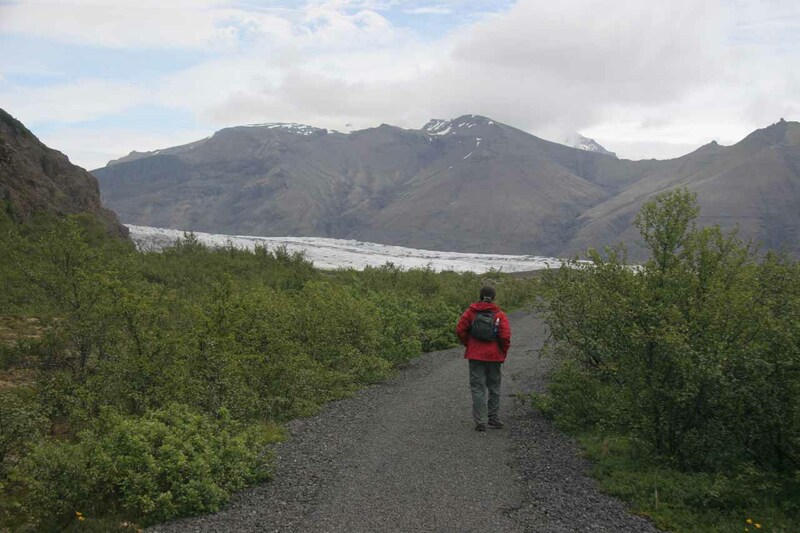 We then went into the Skaftafell National Park at 12:45pm to do the hikes considering we had all afternoon today. 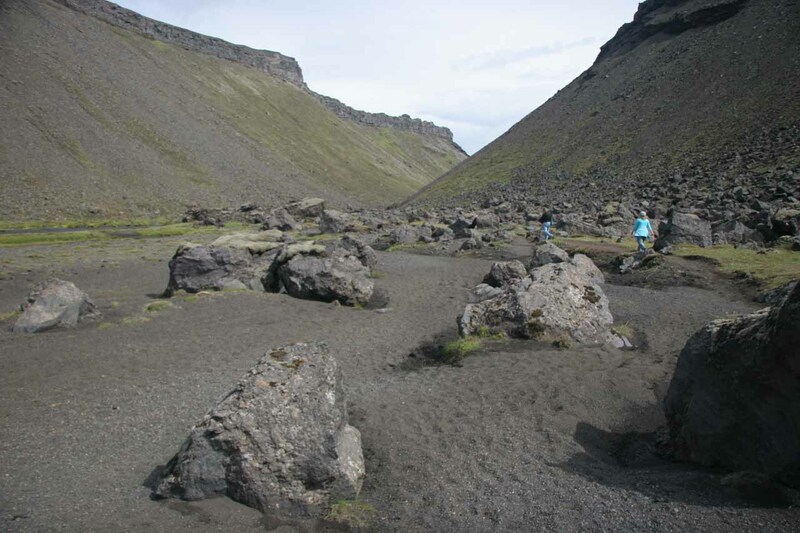 We were certainly way ahead of schedule as I thought we were going to do this hike tomorrow morning as the drive to get here from Egilsstaðir would’ve taken all day. 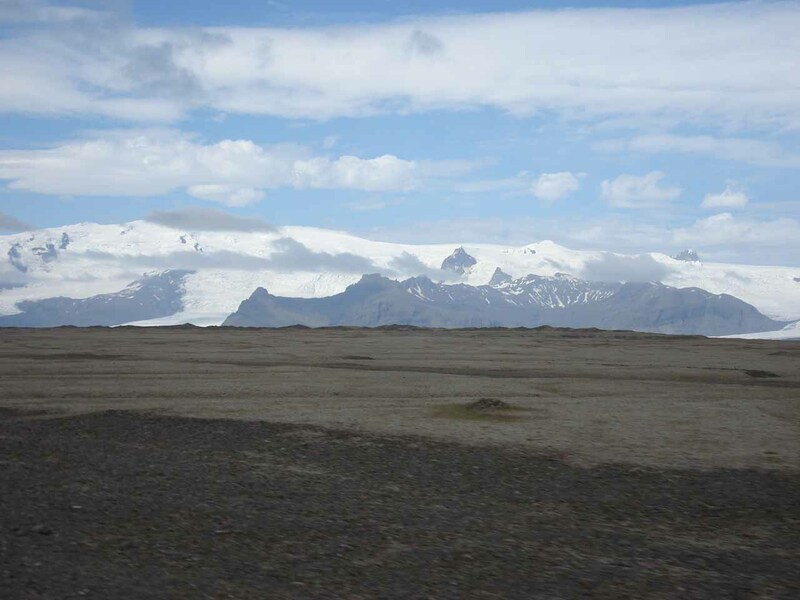 First up, we hiked to the glacier terminus of Skaftafellsjökull. The walk was only less than 2km from the visitor center so we figured why not go for it even though we hadn’t planned on seeing it prior to coming here. 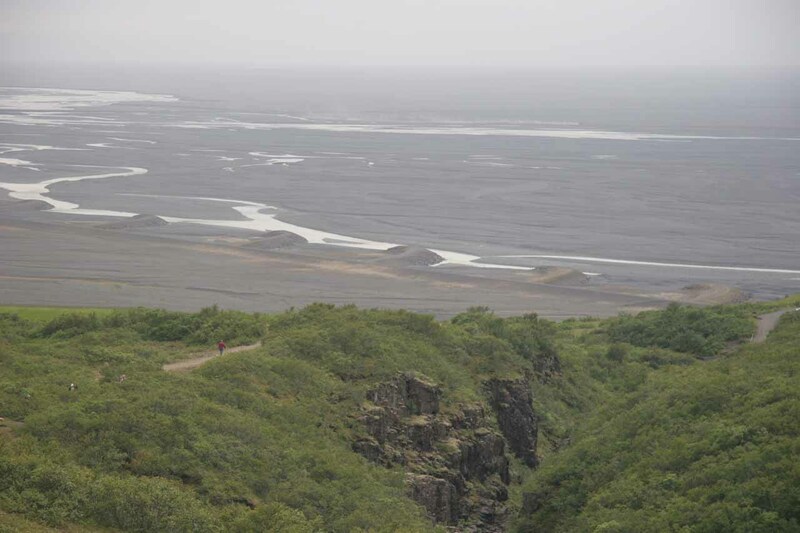 So we did the pretty straightforward hike, where the trail itself was on a sandur left behind by the recession and consequent river depositing of the glacier. 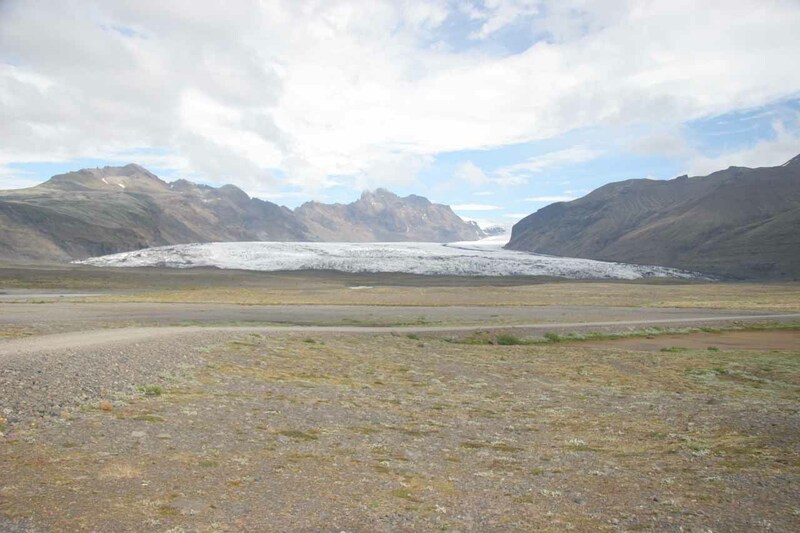 By the time we got close enough to the glacier terminus, which was disappointingly dirty and flat, we decided that it was certainly nothing compared to something like the Briksdal Glacier we had seen in Norway. 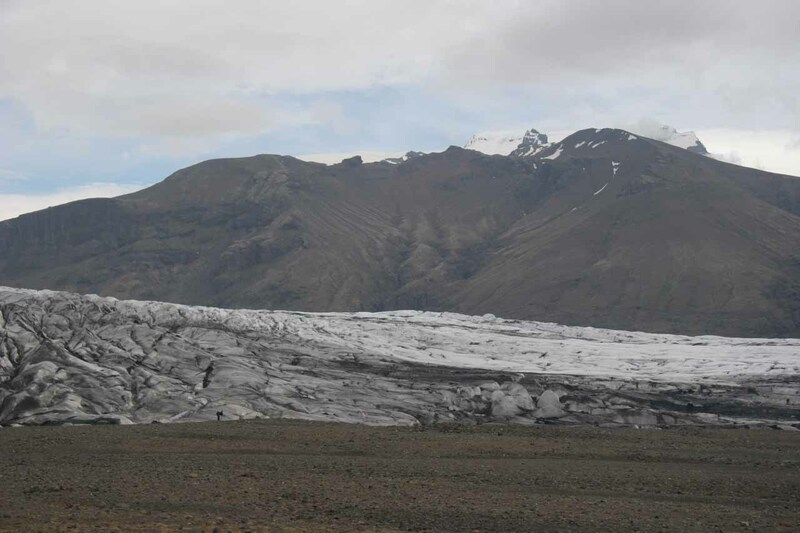 Perhaps what was remarkable about this glacier was the presence of dirty ice, which looked deceptively like more terrain of sandurs. From the warning signs here, we knew we weren’t going to tempt fate and keep continuing to get closer to where we thought the glacier was supposed to be. 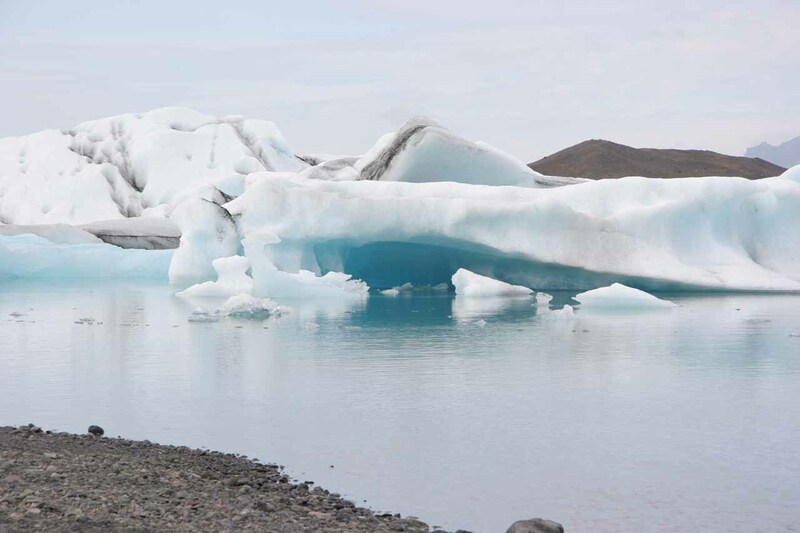 After all, we could’ve very well have been standing on a dirty ice section of the glacier when it would make its next unexpected calving or when there would be a hidden ice cave that suddenly collapsed. 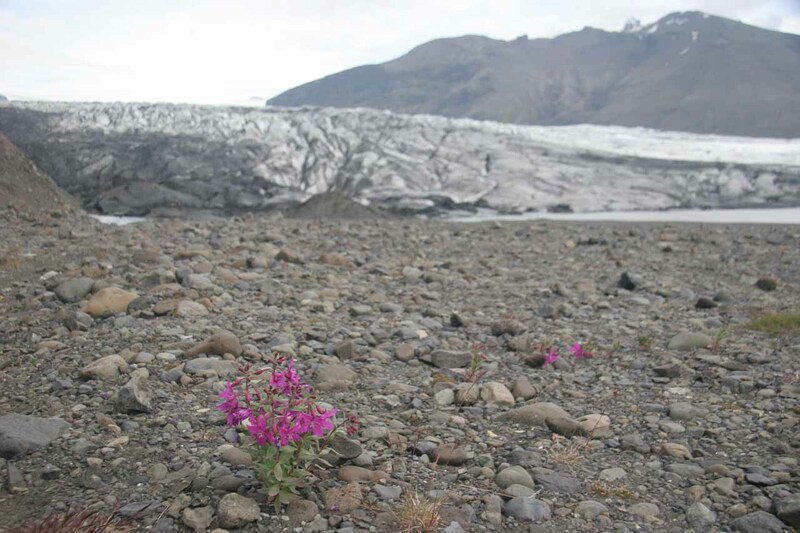 We pretty much went about as far as where we noticed some wildflowers sprouting out from within the sandur and moraines left behind by the glacier itself. 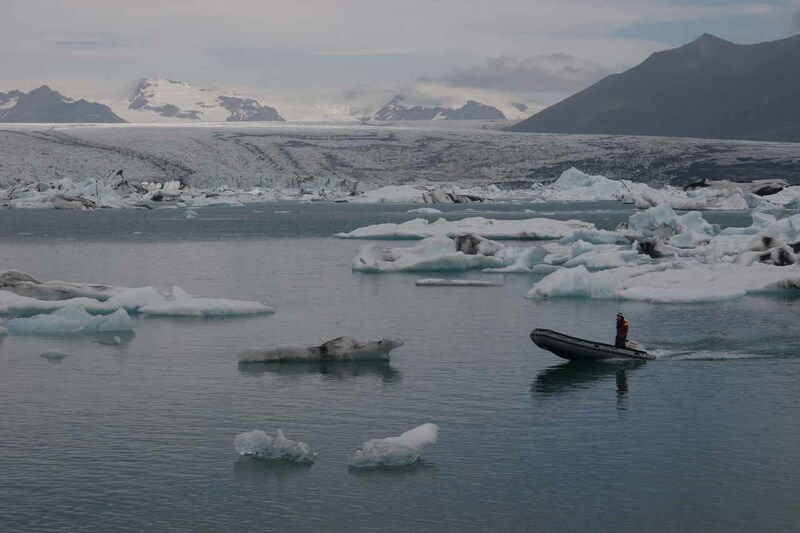 We figured that flowers don’t grow directly on the ice so this was about as safe as any spot to admire the glacier terminus before heading back to the visitor center. 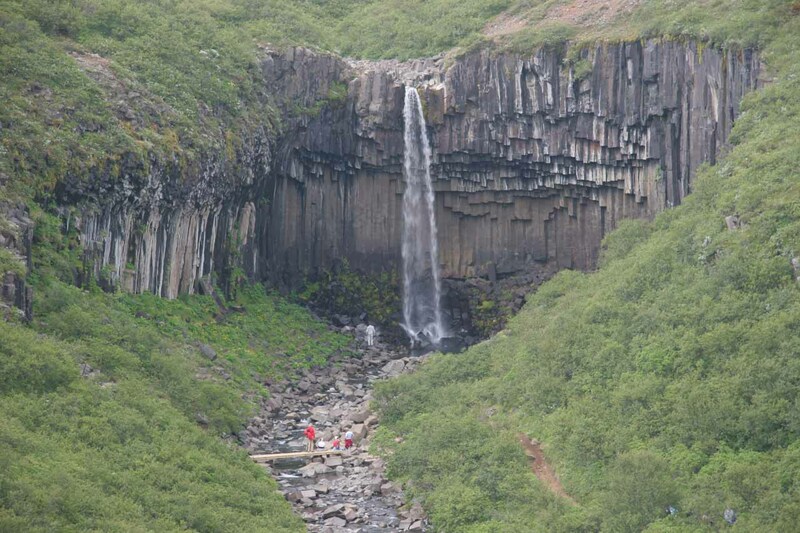 We then hiked the full 1.5km length trail from the visitor center to Svartifoss (“Black Falls”). 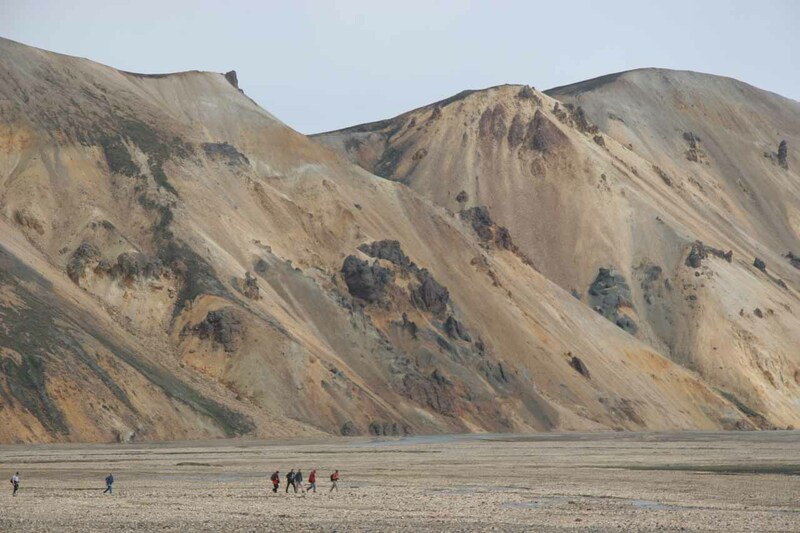 This was the main goal of our time spent in Skaftafell National Park. The trail started seriously enough with an ascent. The bright side of this was that we knew at least this final stretch heading back to the visitor center would be all downhill. As we were nearing the end of this initial climb, we noticed some signage and an overlook for the waterfall Hundafoss (“Dog Falls”). I wasn’t exactly sure why this waterfall was named after dogs, but perhaps one of them might have fell over and was so named in its honor. I certainly couldn’t identify any formations here that resembled a dog during our brief time here. Hundafoss was thin but attractive and tall. 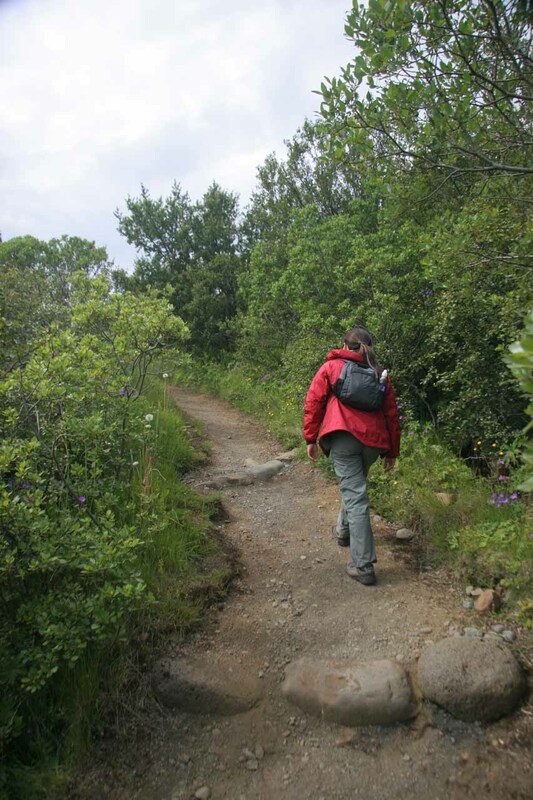 The official overlook didn’t differ all that much from an unofficial spur that the trail makers put obstacles to try to conceal that path. Perhaps it was for good reason then if the views weren’t that different from each other. 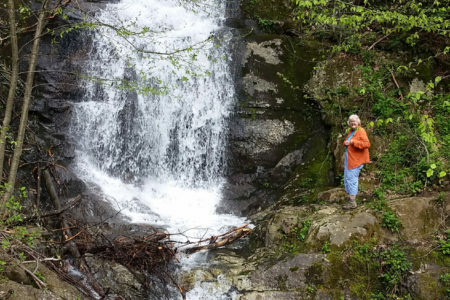 Shortly after seeing Hundafoss, we continued on the ascending trail. We took a short breather given the relentlessness of the uphill climbing, and in doing so, we turned around and realized just how far up we had gone. That was because we were treated to a pretty impressive view of the sandurs in the landscape below us. 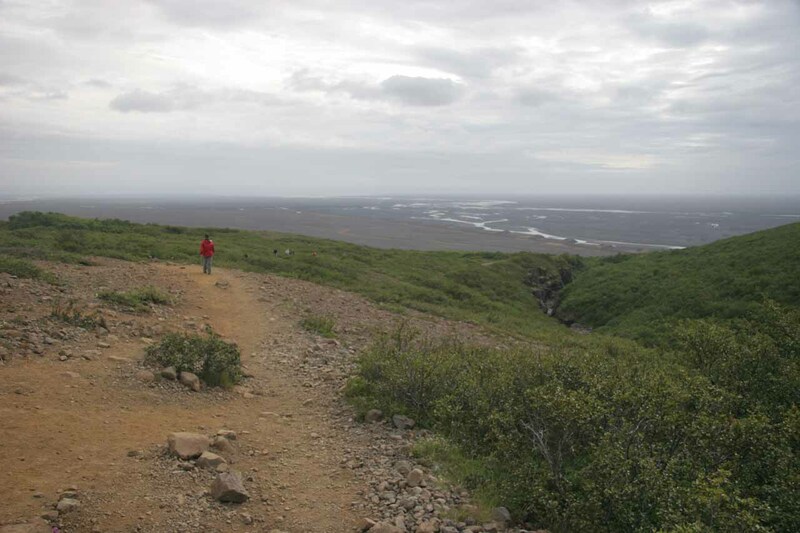 Now long after this break, we saw a signpost and lookout area for Magnusárfoss. We also noticed there were some people that actually hiked or scrambled all the way to the brink of the falls. We weren’t about to do that since we were pretty content with our views from the official vantage point. 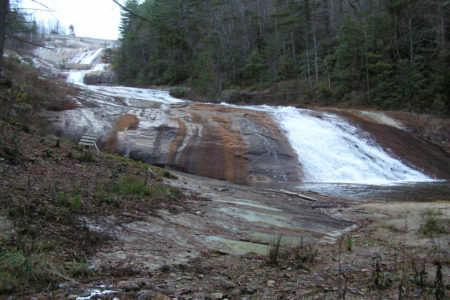 The falls itself was much shorter than Hundafoss, but it had an attractive downstream view. 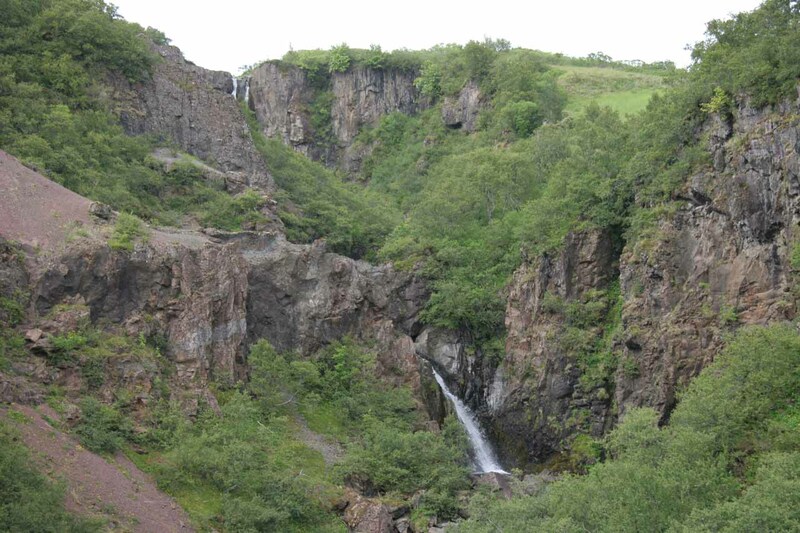 Past Magnusarfoss, we saw there was another car park. 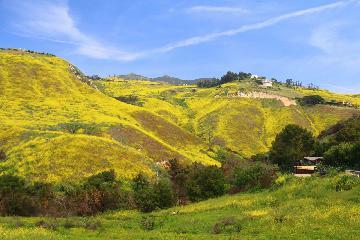 Julie was giving me a hard time because it would’ve reduced our hike had we parked there. Oh well, can’t cry over spilled milk. Still, had we not done this more official hike and did what those tour bus groups did, we wouldn’t have experienced these waterfalls. By this point, the hike definitely leveled out. 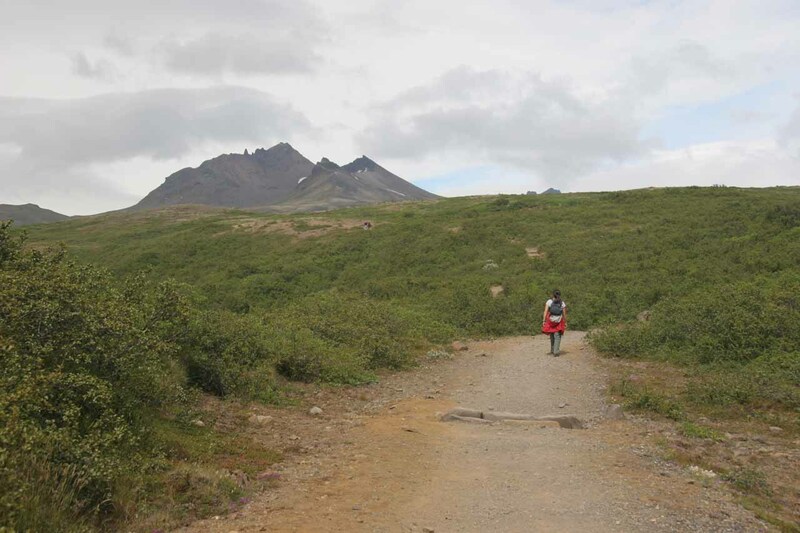 We could see that we were surrounded by low shrubs with the odd mountain or two in the distance. 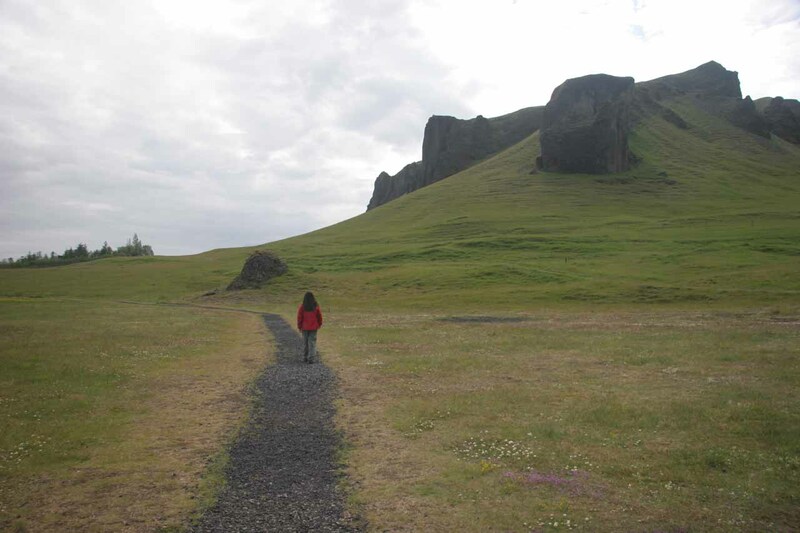 We were now undulating on smaller hills before we finally started to see the acclaimed Svartifoss in the distance. 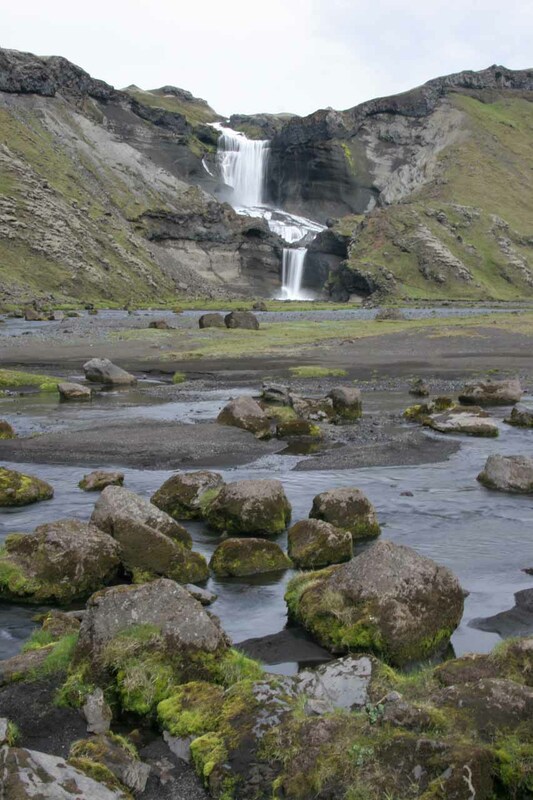 Just a few minutes later, we crossed a bridge over its stream and ultimately found ourselves right in front of the eccentric 20m Svartifoss waterfall surrounded by pronounced basalt columns. 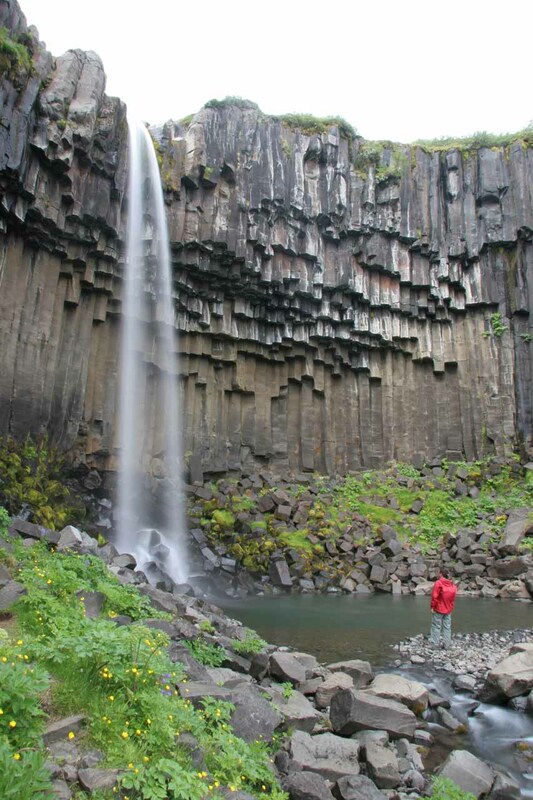 It was probably this combination of pronounced basalt columns combined with an attractive 20m waterfall that made this waterfall as famous as it was. 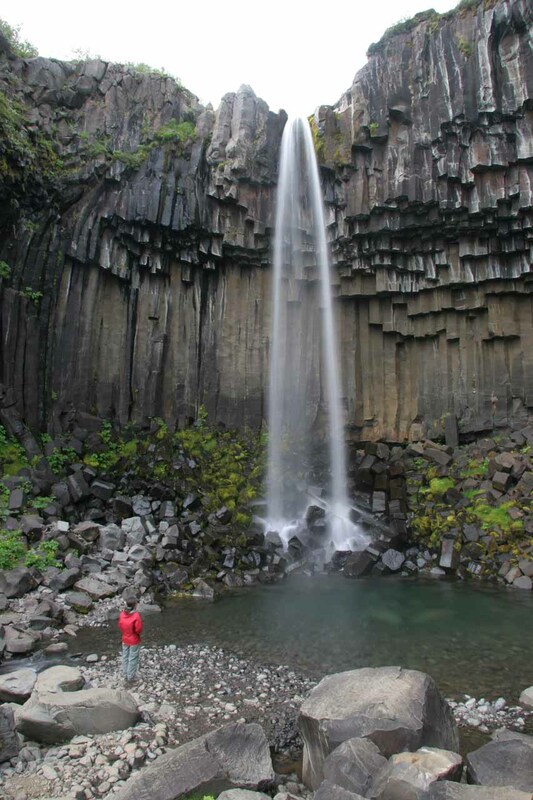 Though since this wasn’t the first basalt-columned waterfall we had seen on this trip (let alone on other trips as it was surprisingly more common than we would’ve ever imagined), it felt more like a standard waterfall. 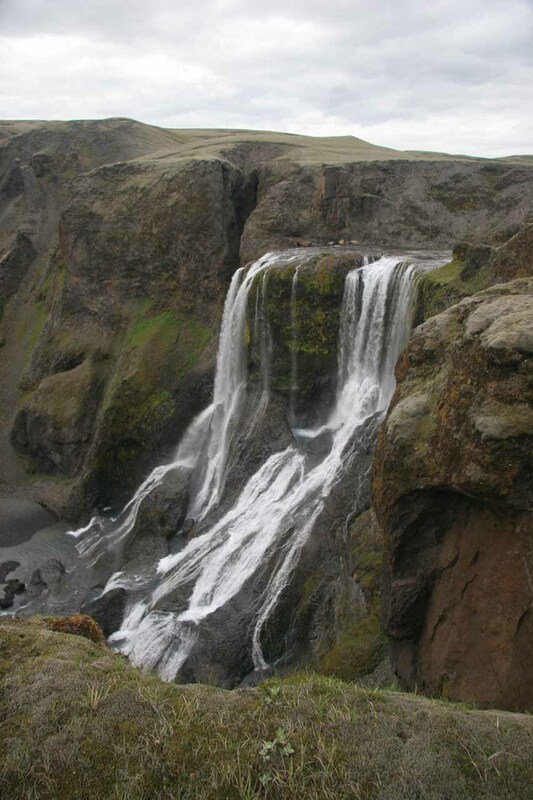 By Icelandic standards, this waterfall wasn’t really much considering its relatively tiny waterflow, but it was still a busy trail and it seemed like a moment when we would be around the falls without other tourists trying to get their shots. On this day, we heard many of the visitors speaking French and Spanish so we reckoned those were the tour groups that came today via the cheaters’ way. On the return hike back to the visitor center, we realized how far up we had ascended especially as we were about to descend that slope that would eventually get us back down to the visitor center level. Indeed, the sandurs in the distance were vast, and it was hard to believe how long it took to even drive through such vastness to even get here. By 5pm, we were back at the car park. 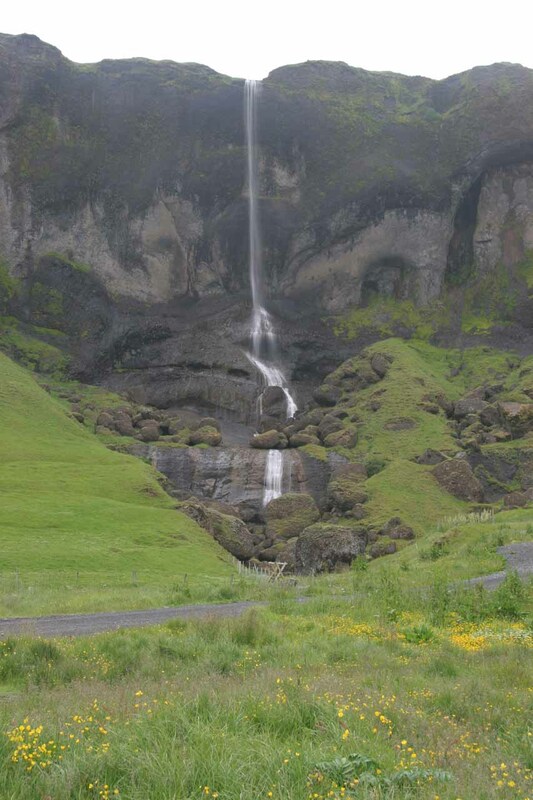 I knew there was a fourth waterfall around here (based on our pre-trip research) so we drove a little further beyond the visitor center on a very narrow road towards a rocky car park (on the way to the cheater’s car park that we noticed during our hike to Svartifoss). 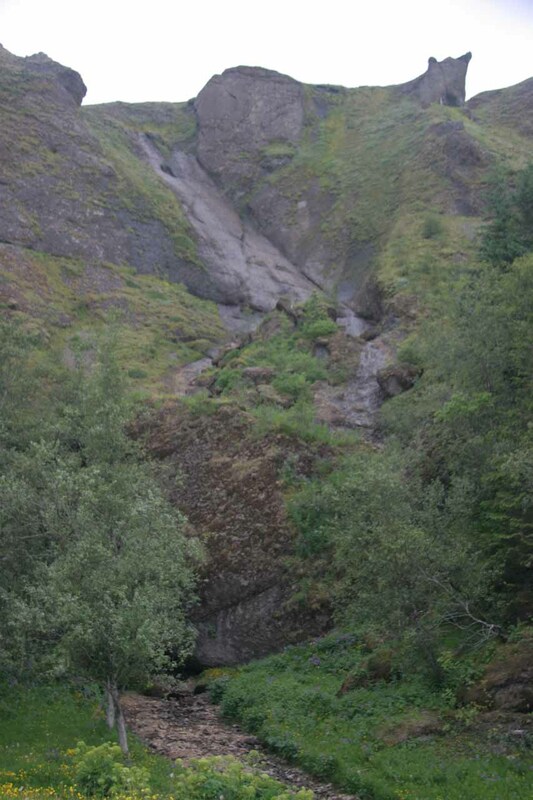 I walked up the trail from the other side of the watercourse and it wasn’t long before the trail met the first hairpin turn of the road and immediately nearby was the lookout platform of Þjófafoss with a hint of Hundafoss. 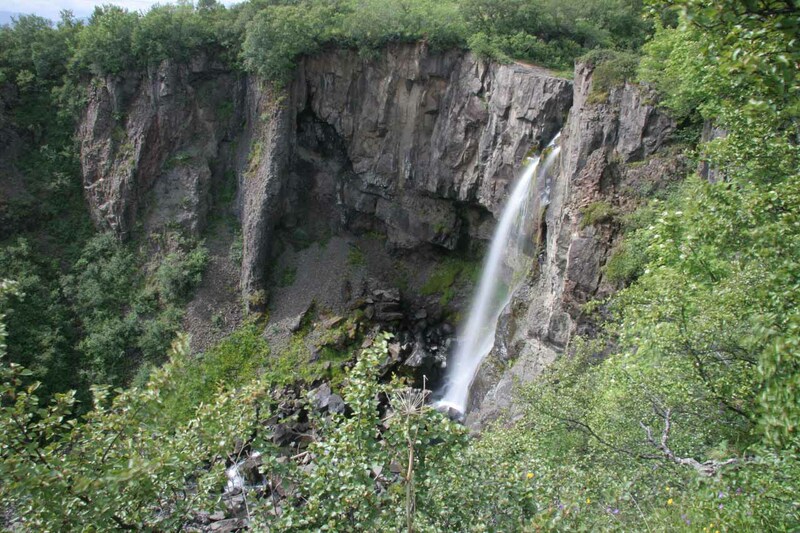 Clearly this waterfall wasn’t visible from the Svartifoss trail. Nonetheless, I was glad I saw it, but again it wasn’t much to brag about. 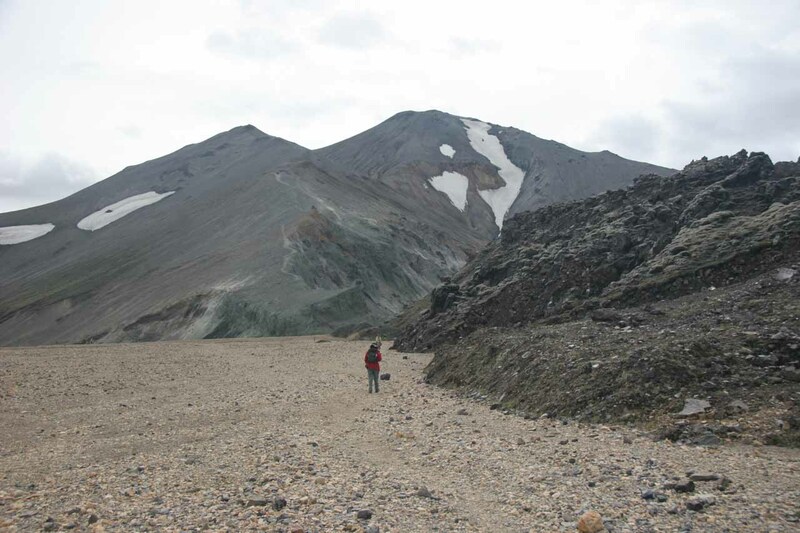 Just for kicks, we then continued to drive the road which ascended steeply in a single lane. As expected, we eventually ended up at that car park that Julie gave me a hard time about. But having been up this way, I wouldn’t really recommend parking here just to cut a few minutes off the hike. This was especially since this road supported bidirectional traffic, and I could just imagine how difficult and awkward it would be to wait for someone to back up on the steep single lane road. Not exactly a fun experience I reckon. 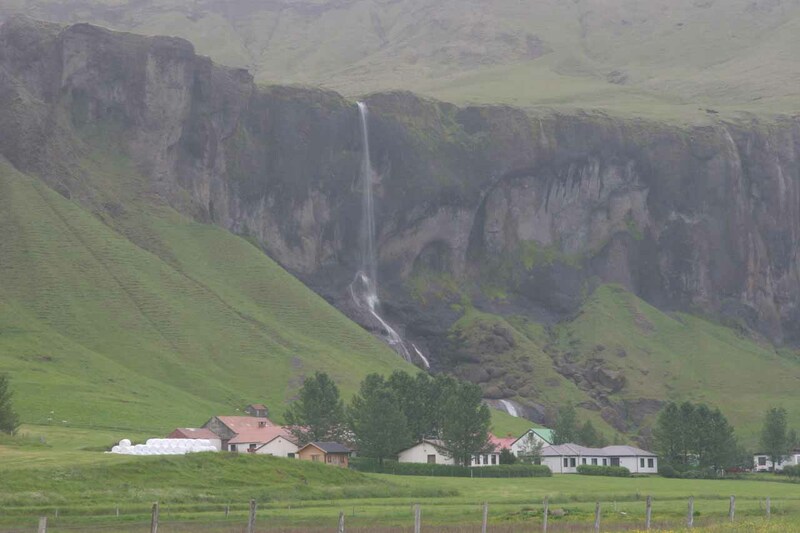 We awoke and didn’t take long before we checked out and left the Hotel Skaftafell just before 8am. It was cloudy and drizzly weather on this day. 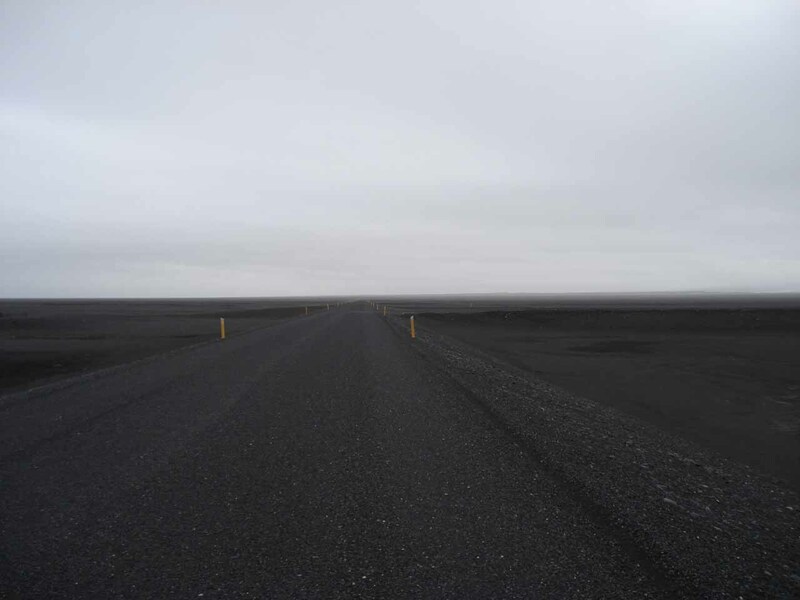 Our drive continued through the massive black plains of sand (sandur) where sometimes it was hard to distinguish between where the road’s paved shoulder ended and the black gravel from the glacially scoured valley began. 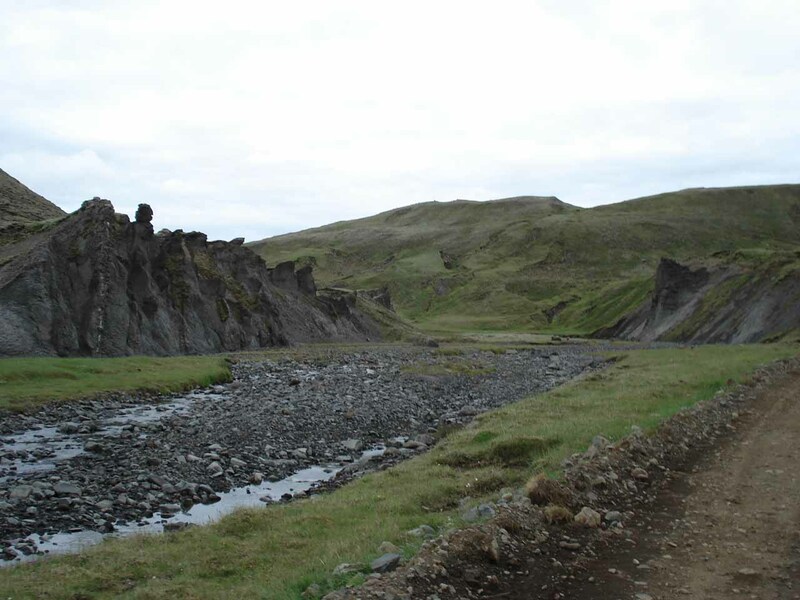 There was even a very long single-lane bridge (einbreið bru) with pullouts within the bridge as it traversed a particularly wide glacial river. It’s hard to imagine how difficult it must’ve been to cross these monsters before these bridges were built. 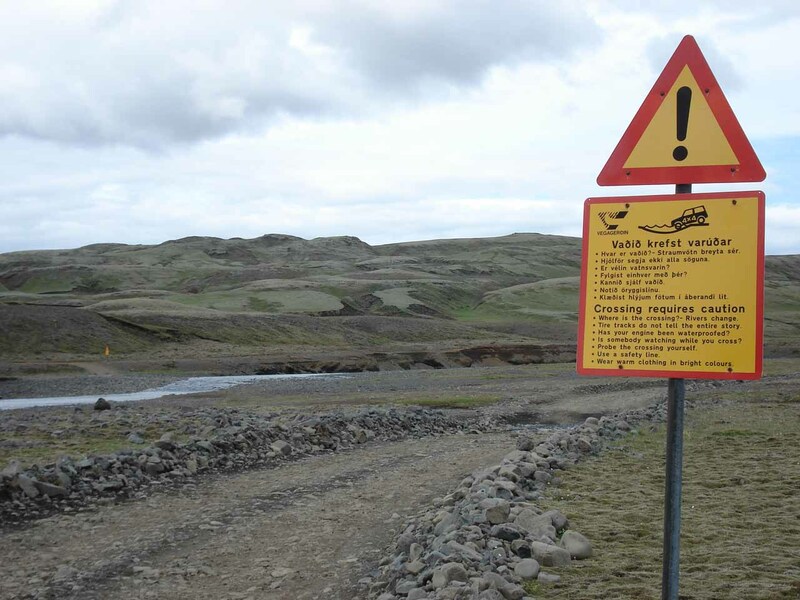 But recalling from one of the signs we noticed before getting here, we knew that having the bridges built and completed here in the 1970s was the key to making East Iceland more accessible via the Ring Road than ever before. 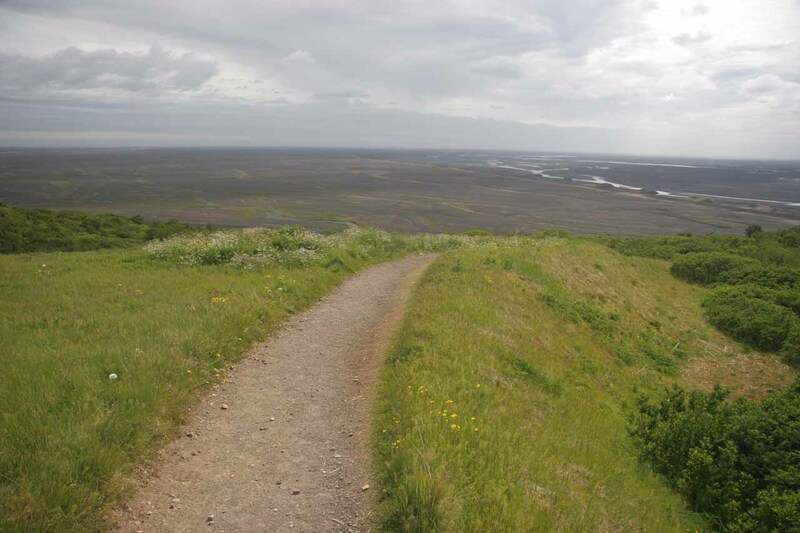 We were on our way to Kirkubæjarklaustur (or “Klaustur” [pronounced cloister] for short). 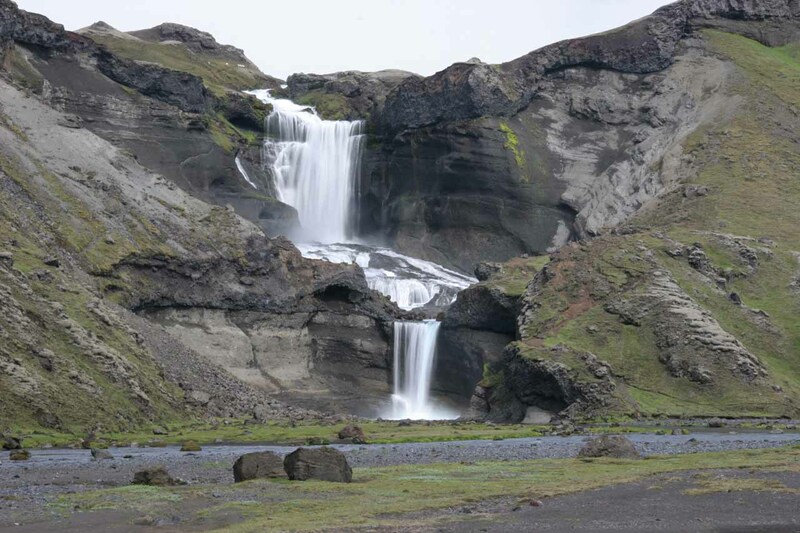 It was during this stretch that we stopped briefly for a roadside waterfall known as Foss á Siðu, which was a tall but light-flowing waterfall behind the Siðu farms. Truthfully, this waterfall was not all that remarkable given its light flow. 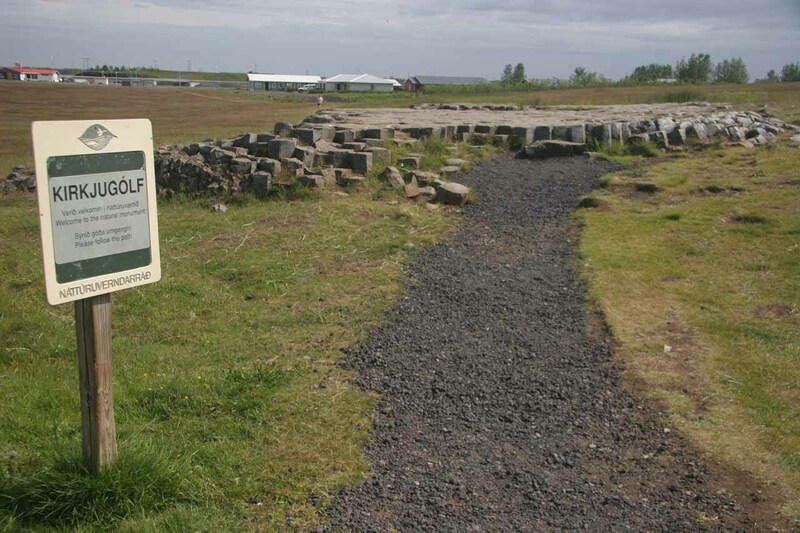 But perhaps it got some notoriety in the literature simply because of the attractive farms fronting it as well as its conspicuous location on the Ring Road. 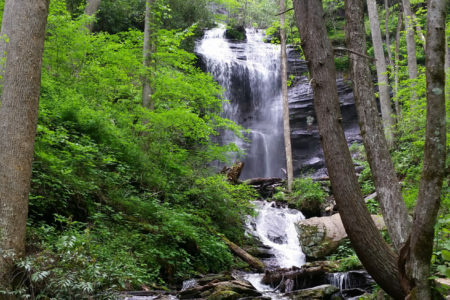 Otherwise, it would’ve just been another one of those dime-a-dozen waterfalls that tend to get taken for granted. The drive then continued onwards to Klaustur where we were way too early to check into the Hotel Geirland guesthouse at 9:45am. 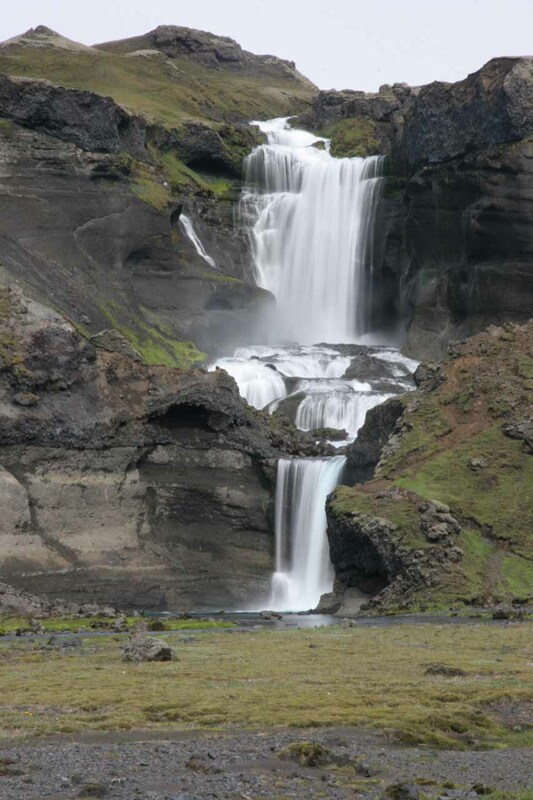 So we spent some of this excess time visiting Stjórnarfoss, which was a small yet intriguing waterfall on the way to the guesthouse. 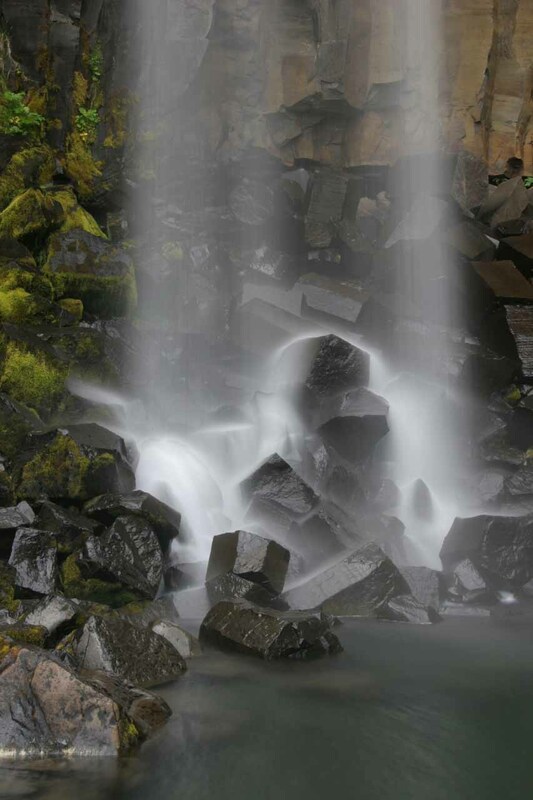 We spent some time here to get closer to the waterfall for a closer and more intimate look at this rounded falls. The canyon further upstream from the falls looked intriguing, but for all intents and purposes, it was sufficient for us just to check out the falls and then continue with our touring. 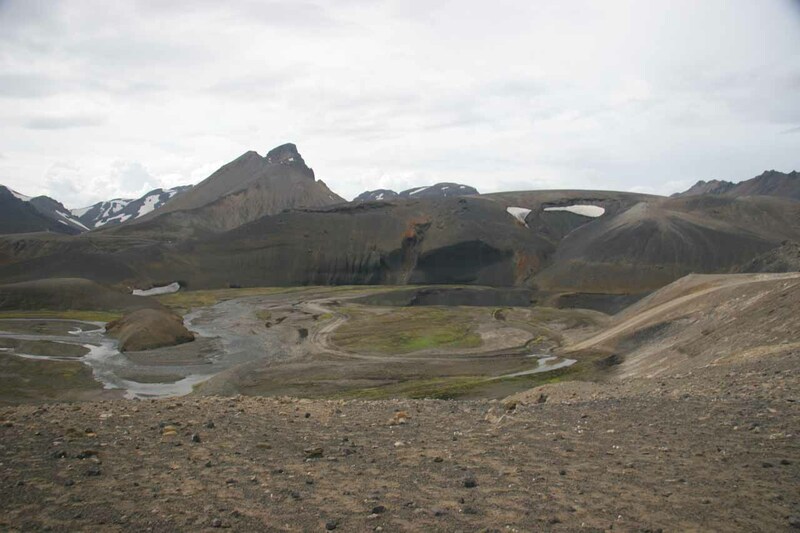 We also drove to the far west side of Kirkubæjarklaustur in search of Systrafoss. Unfortunately, this twisting waterfall wasn’t flowing at all. 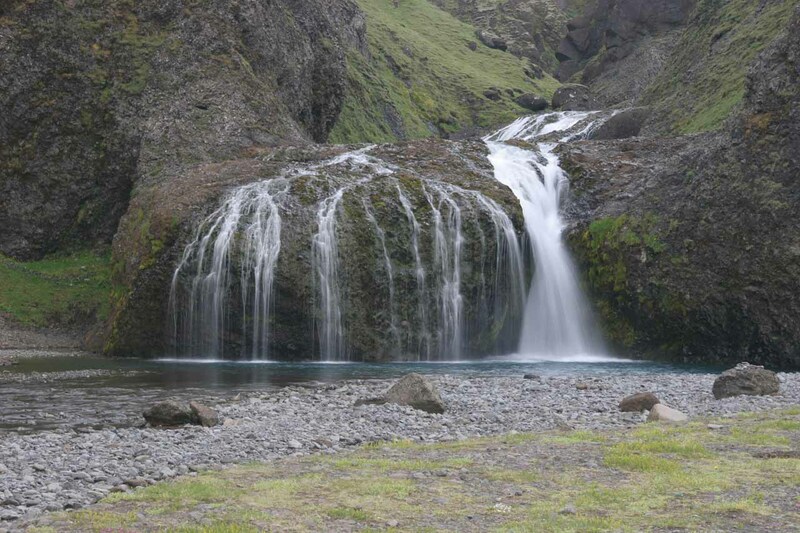 We couldn’t believe that a named Icelandic waterfall could actually go dry like this during the start of their summer when the falls should be pumping. We couldn’t quite figure out why this was the case given that so many of the other waterfalls seemed to be flowing pretty well. I guess this thing would only flow during the wet and harsher climates of the Spring season than in the Summer. Still, something didn’t quite add up about this falls. 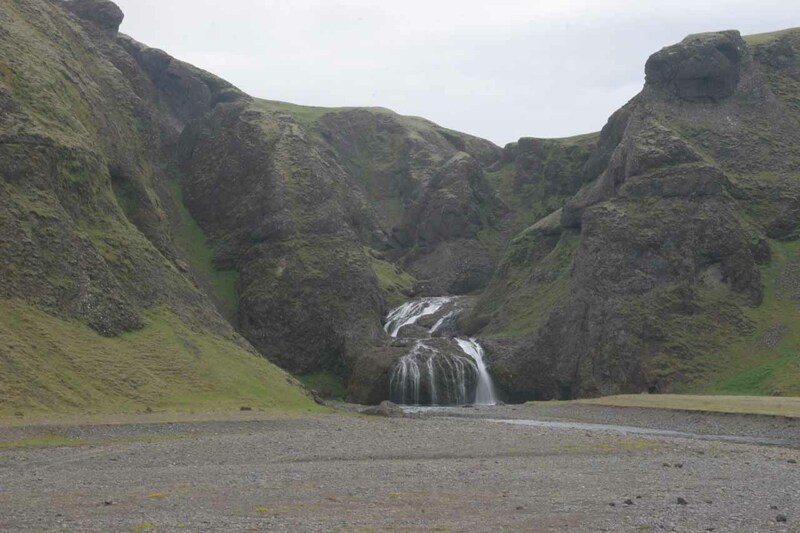 Next, we had originally intended to do the rather lengthy out-and-back detour to Dyrhólaey considering we had another six hours or so before we could check in to the Hotel Geirland. 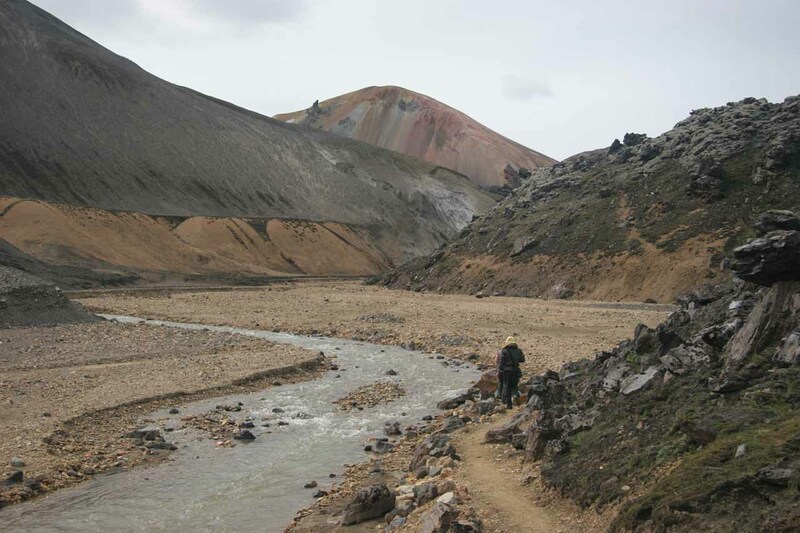 However, we thought we might as well scout out the 4wd road to Laki just to see how bad the road is and more importantly how bad the river crossing would be. And so that we did. If conditions were too bad to make it on our own, then we’d take a 4wd tour to get there tomorrow or the day after. It was the very reason why we were spending so many nights (3) at Geirland in the first place. The road initially started out paved to some other accommodation called the Hundabakkar, but sure enough the road went gravel and then became the F206 which was bumpy with large rocks strewn about the mostly single-lane road especially on the hills. Clearly a low clearance vehicle would have a very hard time getting through on this road. 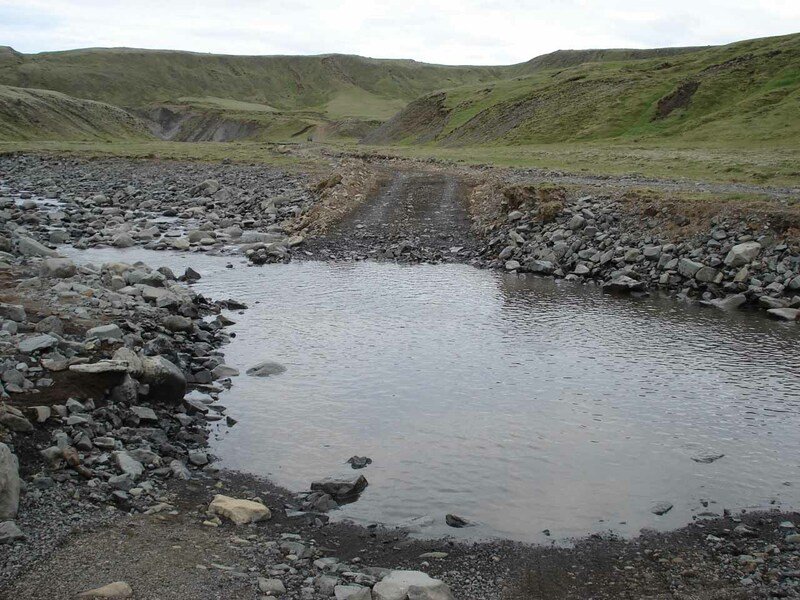 After about 20 minutes of driving, we started to drive into what seemed to be a riverbed. 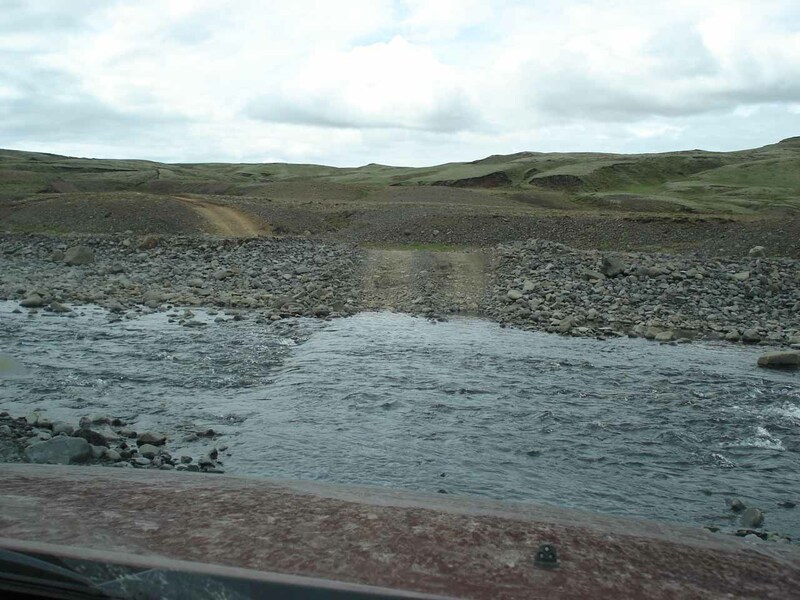 It was very rocky but still driveable but it wasn’t long before we saw what appeared to be a pretty deep river crossing. By this time, there were three 4x4s behind us so we pulled off to a rocky shoulder and let at least the first two vehicles with monster truck wheels go through without a hitch. The third SUV noticed our hesitation. 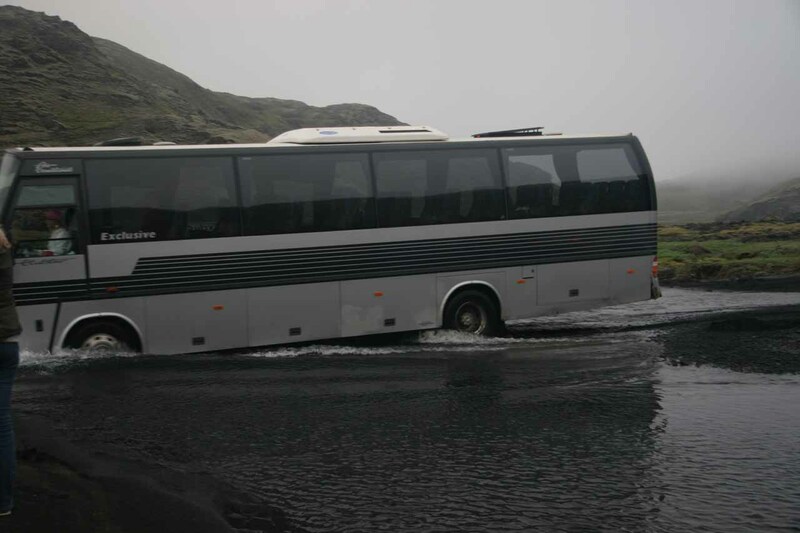 The driver of that vehicle got out and said something to me in Icelandic. 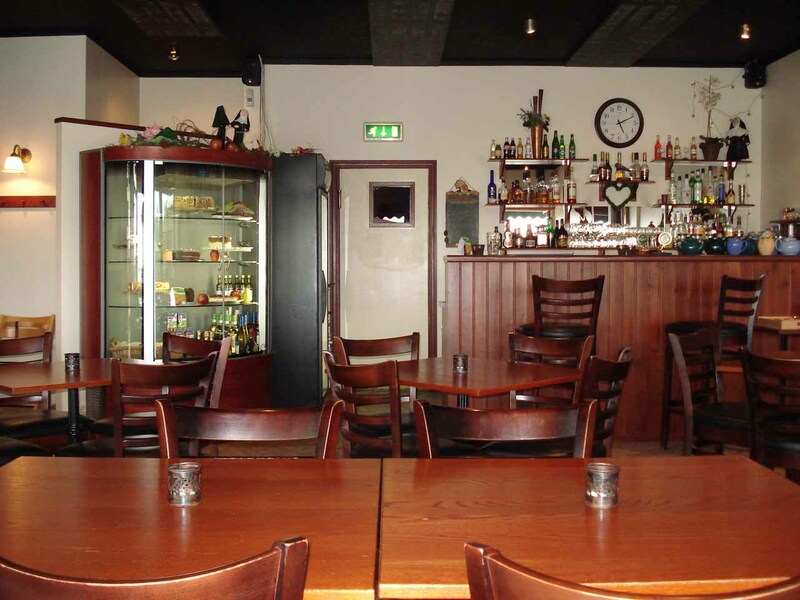 “Uh, talaðu ensku? Ég tala ekki íslensku,” I said, not understanding what he just asked me. He then said something to the effect that you’re Icelandic is fine, but he switched to English and asked if the ford was too deep. I told him I wasn’t going to try it, but then he looked at our vehicle and told me we can easily handle anything 1m or less in depth. So with that, he took the initiative with his similarly sized SUV and we followed suit. It turned out it wasn’t that bad. So that was the first time we did a river crossing on our own. I was still fearful of more of these crossings, but I suppose I considered myself initiated on driving a 4wd road. The drive then continued onwards alternating between rough hills and smoother plains. 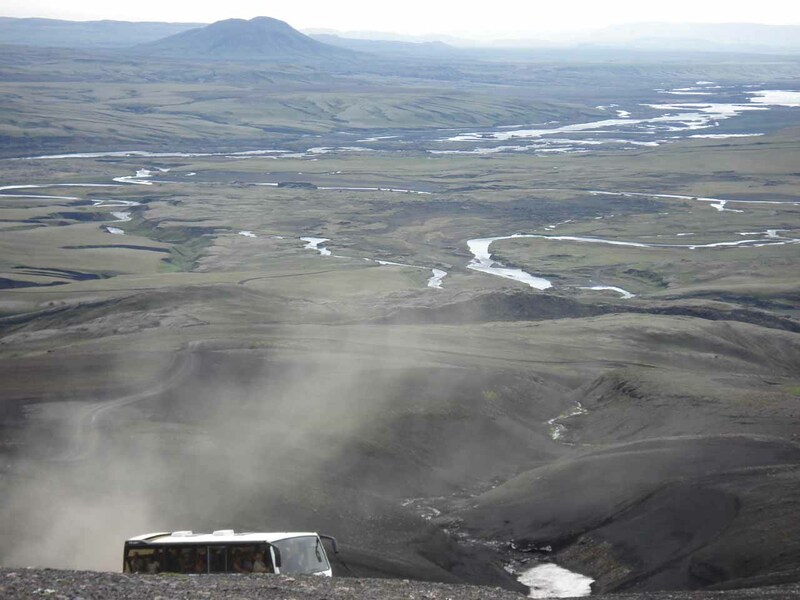 There were a few sections where we continued on driving in very rough riverbeds full of larger rocks and mini boulders. And progress on those sections was quite slow going given we didn’t want to be disabled out in the middle of nowhere. Eventually, we’d pass by a scary-looking sign indicating that river crossing paths may change depending on the current conditions. The track up ahead sure looked intimidating, but at the same time, we noticed there were people on some overlook way across the river on some outcrop. 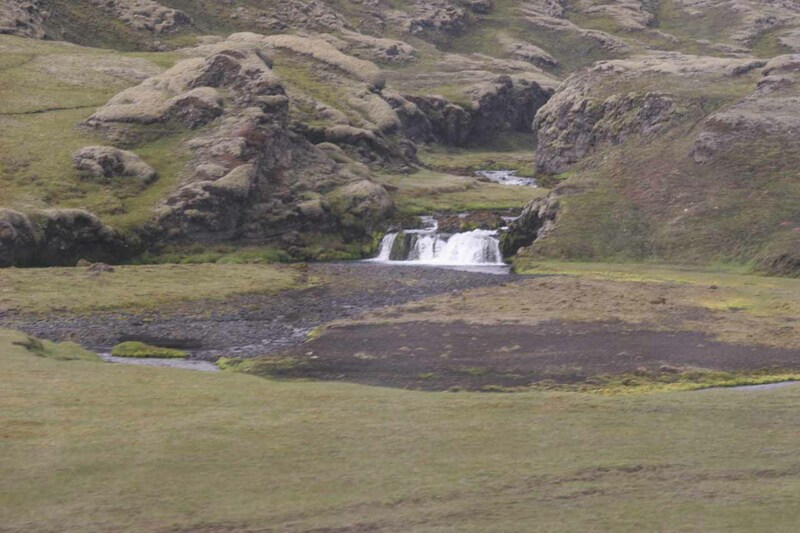 We figured that must’ve been Fagrifoss. Once again, the SUV in front of us waited for us before going through the pair of river fords. The first one looked scary and it had a current, but it was short. After seeing how he got through with no problem, we followed suit and encountered no further difficulty. The next ford also looked deep but it turned out to be not as bad. 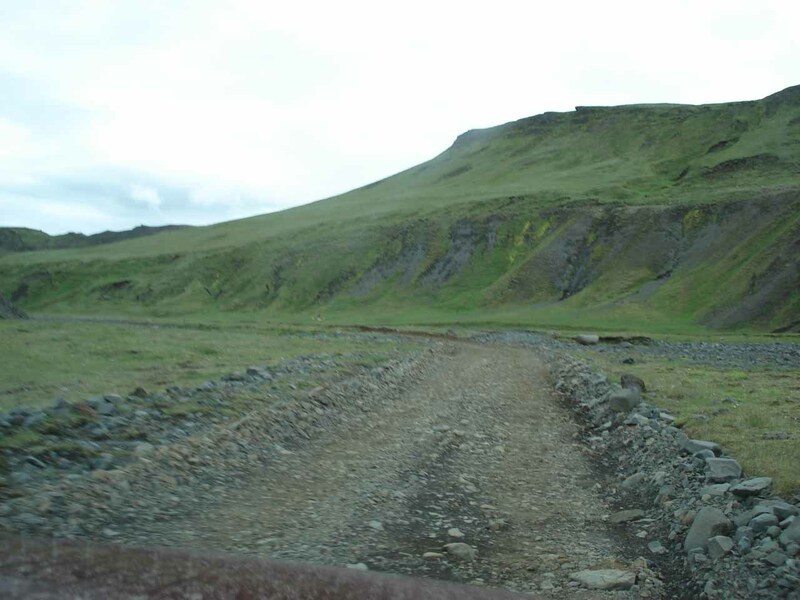 Then, the road continued along some rocky track before reaching a signposted junction for Fagrifoss. 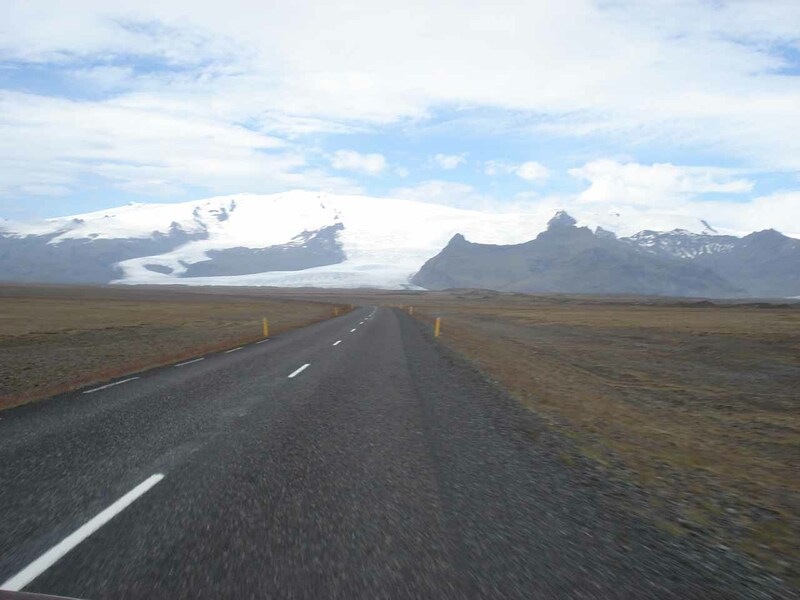 The generous Icelandic guy continued towards Laki, but we turned right and headed up the rocky hill towards the car park. I rolled down the window and waved at the SUV before us to try to show our appreciation. It wasn’t much longer before we joined two other big SUVs at the car park. They were on their way out though so Julie and I had Fagrifoss all to ourselves. It was 11:45am. 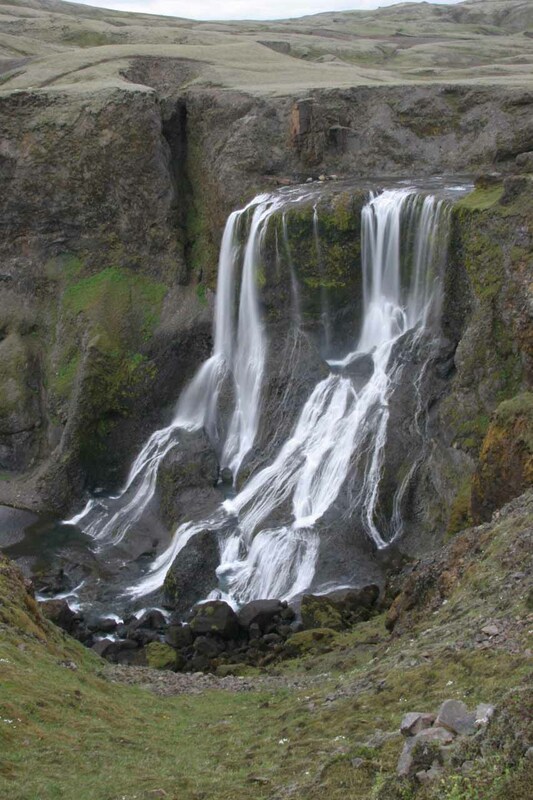 The falls itself was at least 30m tall with a few strands twisting and splitting amongst the rounded volcanic cliffs. All the views were from the top of cliffs so it was not possible to get to the bottom of the falls. Still, the falls were quite satisfactory to see anyways and we took what photos we could. It turned out that the best views of the falls weren’t from the endpoint of this trail, but from an opening prior to the end. At the very end of the trail, it was a bit too precarious to try to peer totally over the edge of the cliff for a cleaner look at the falls. That was just too much risk for us, especially when we knew that we could get a pretty good view of the falls already. 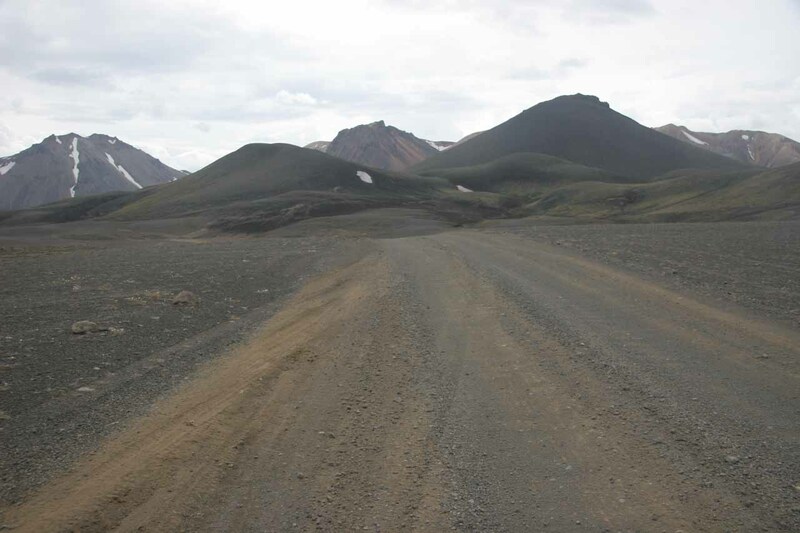 In any case, we didn’t want to linger too long just in case the new tires we got from Akureyri were about to go flat after all the sharp rocks I’ve seen on the 4wd road. 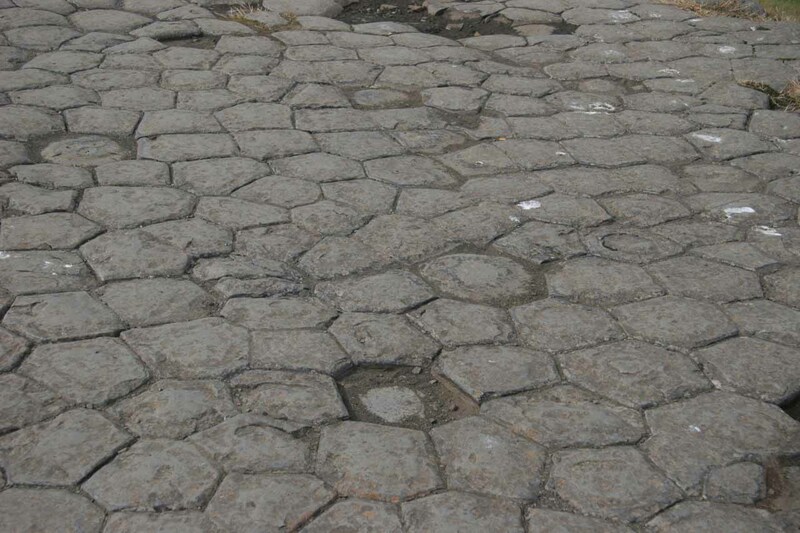 I also worried about these things on unpaved roads in general, but especially on this trip since it has happened twice already (once in Buffalo, New York and once in Vatnsdalur in Iceland)! 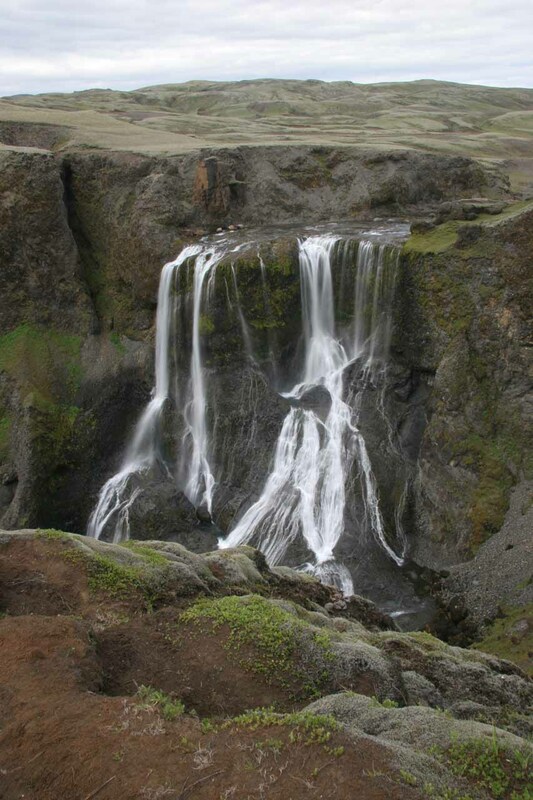 I had also realized that our last two river crossings were on the river that fed Fagrifoss. 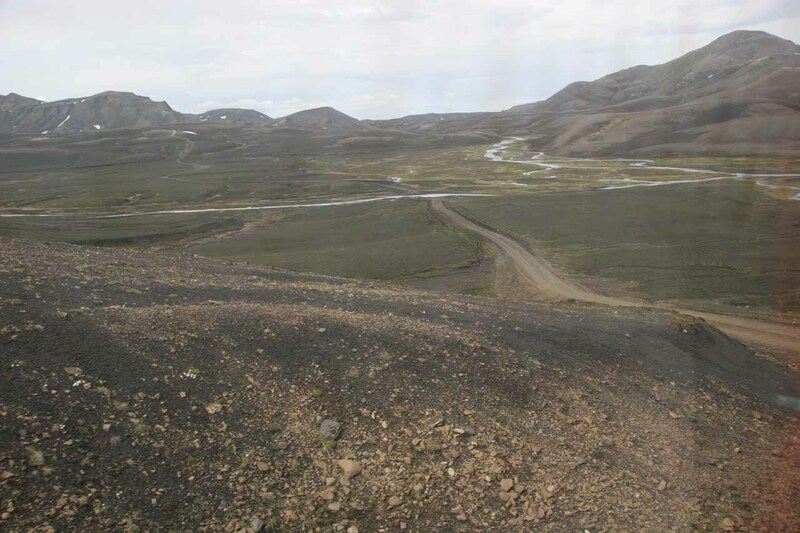 In fact, we could see the 4wd river crossing signs from the Fagrifoss overlook. 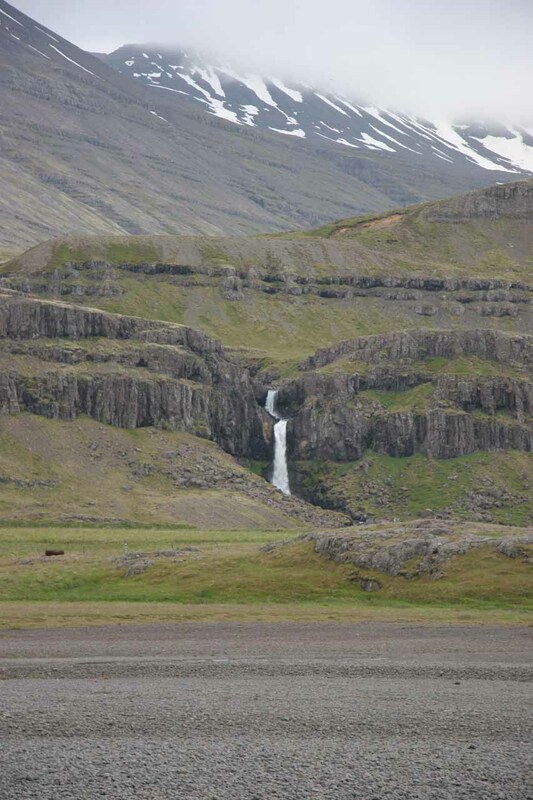 I shuddered at the thought of the river being higher and possibly sweeping 4x4s over the 30m waterfall! We opted not to go to Laki and drive another 15 miles or so on nasty roads. So we headed back towards Klaustur on the very same bumpy roads we took to get here. At least in this instance, we had some confidence in getting back knowing that we made it here in the first place with some trepidation but at least with some success. 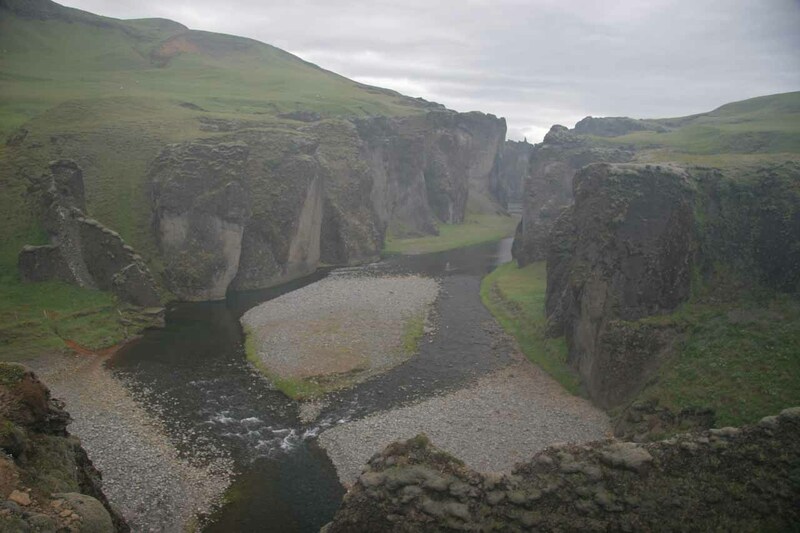 Before we returned to the Ring Road, we made a brief stop at Fjaðrárgljúfur, which was a scenic gorge not too far from the Laki turnoff. Unfortunately, some film crew was shooting some Peugeot commercial so we couldn’t see the gorge from the bridge. We decided we’d come back later in the day for that. Besides, it was foggy this morning anyways. At 1:15pm, we were back at the car and we made our way back towards town. 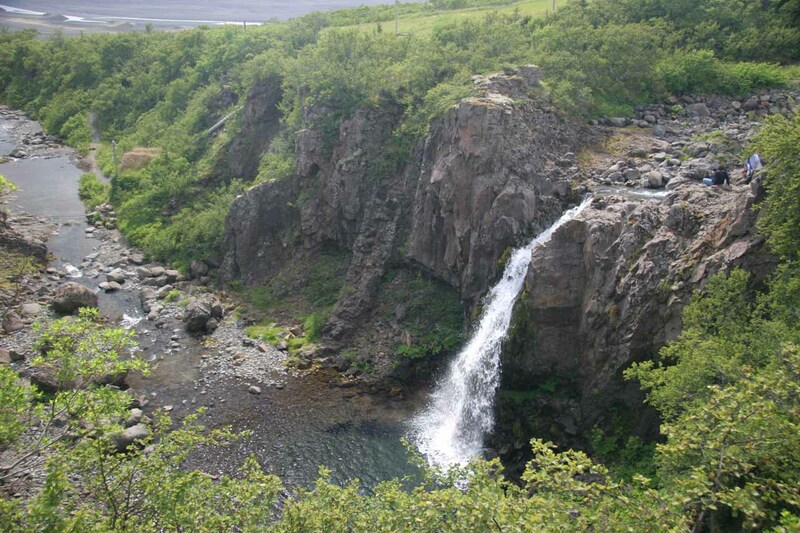 On the way, we noticed another tall waterfall that was kind of on the quality of Foss á Siðu from this morning. But this was more or less a standard roadside waterfall, and we didn’t find a way to get closer (not that there was one from what we could tell). While in town, we had ourselves some $20USD fish and chips at the N1 station in town. We then spent some time at the visitor center inquiring about the Landmannalaugur road, which was also a 4wd road. The clerk said our car should be able to handle it, but they do offer tours for about 2700 Ikr per person each way, which was actually surprisingly reasonable considering the type of road it goes on and how much fuel it would require. I guess we’ll figure out whether to do it on our own or not tomorrow morning when the bus leaves at 9:30am from the N1 station. With still some time to kill on this day (we were way ahead of schedule – especially with our Fagrifoss excursion, which I had allocated a whole day to do on a 4wd tour either tomorrow or the day after), we checked out the Kirkjugólf, which were basalt column floors that previous discoverers had thought were manmade for the church. 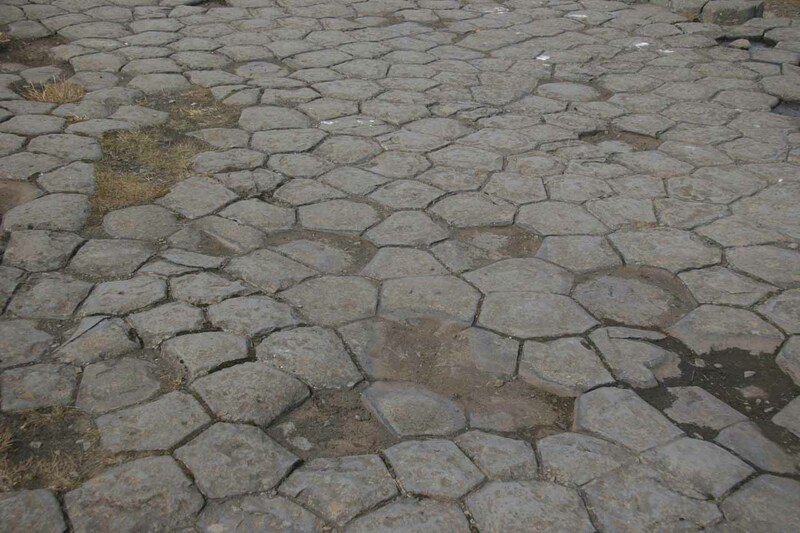 In actuality, the hexagonal patterns were naturally occurring and they’re very similar to the top of the Devil’s Postpile Formation in California’s Central Sierras. So given its close proximity to our accommodation, we had little trouble getting there. 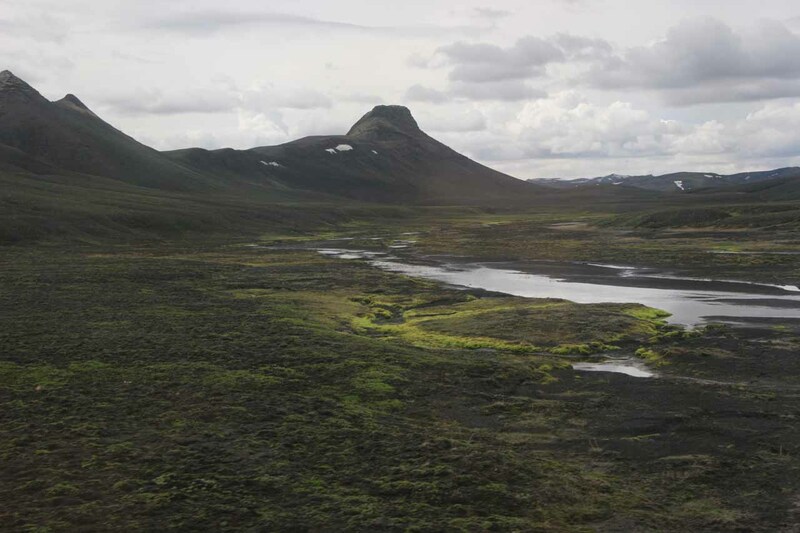 Then, we got out and did the short walk on some grassy-matted plains leading to the hexagonal flooring of Kirkjugólf. Although the short walk was interesting, the postpile flooring was where we spent most of our time (as we should be). 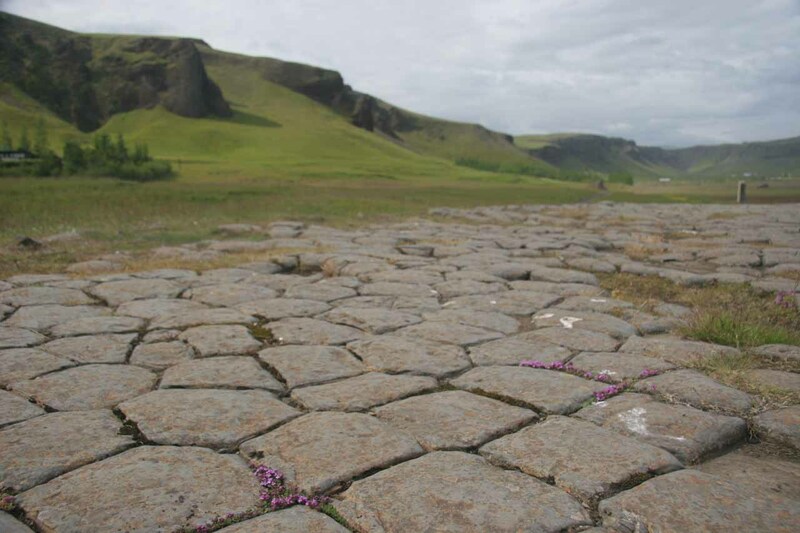 It was especially interesting to see wildflowers growing out of the cracks between the hexagonal patterns. By 3:20pm, it was finally close enough to 4pm to check in to Hotel Geirland, which we did. 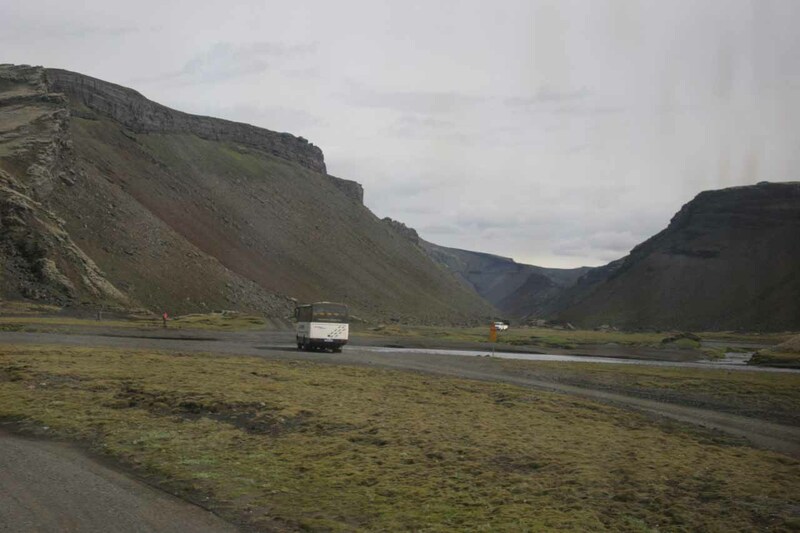 Then, we headed back to Fjaðrárgljúfur, but not before being stopped by the same filming crew on the Ring Road who I guess decided to do some shooting on this busy highway. 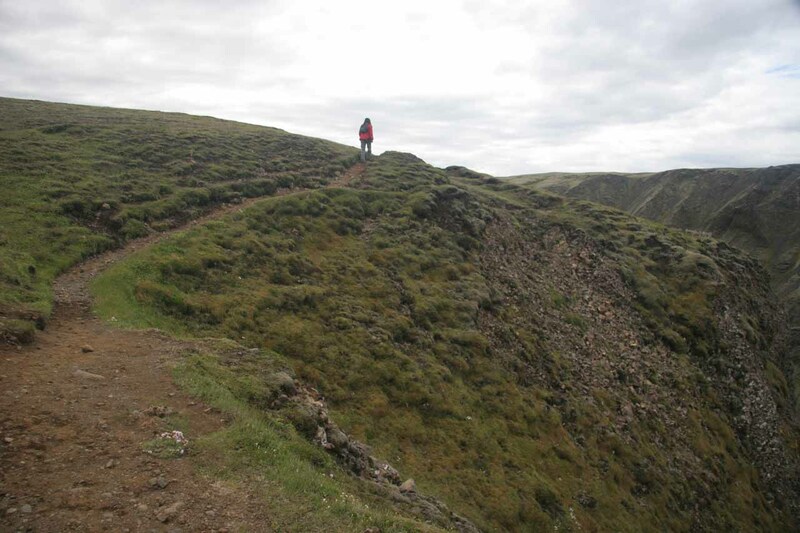 We’d eventually get to the gorge, get our photos while battling annoying midges, and then get back to Klaustur. We opted to have pizza at the Systrakaffi (the Sister’s Cafe), which costed us about $25USD but I didn’t feel like spending another $80USD for dinner for things like lamb, fish, or other mains again. And with that, we returned to our guesthouse room. We still have tonight and two more nights at this guesthouse so we have lots of flexibility about what to do for the next few days. Today was July 4th – Independence Day for Americans. 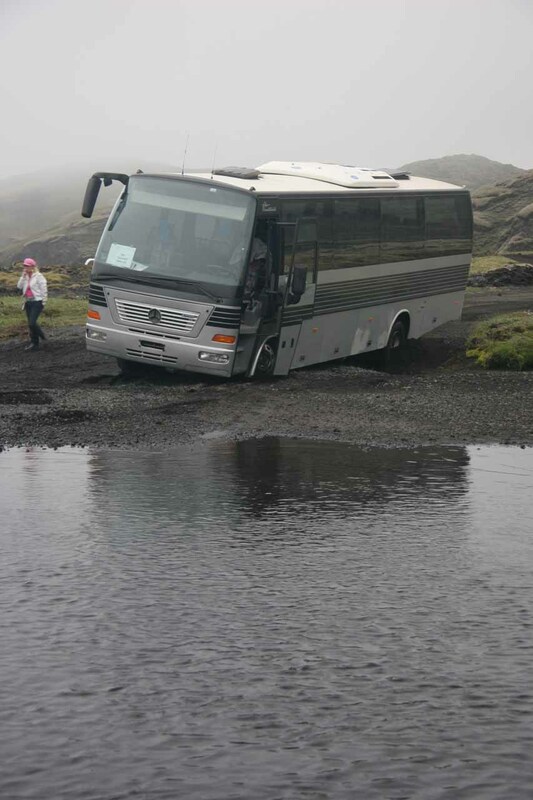 But it was also the day that I didn’t have to drive because we decided to do the tour to Landmannalaugur and hopped on a Reykjavik Excursions (Kynnisferdig) bus. 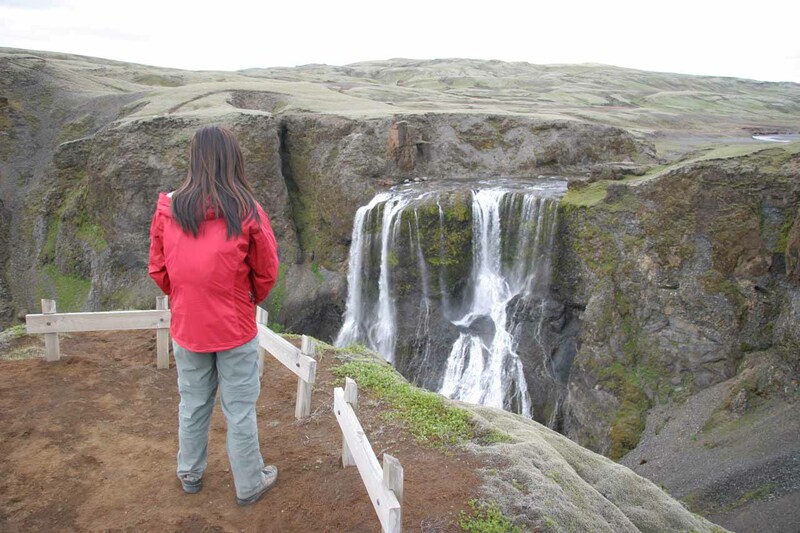 While many people spend a night at Landmannalaugur, we were going to do this as an out-and-back day trip. The mostly cloudy skies were light enough to let the sun get through for moments. 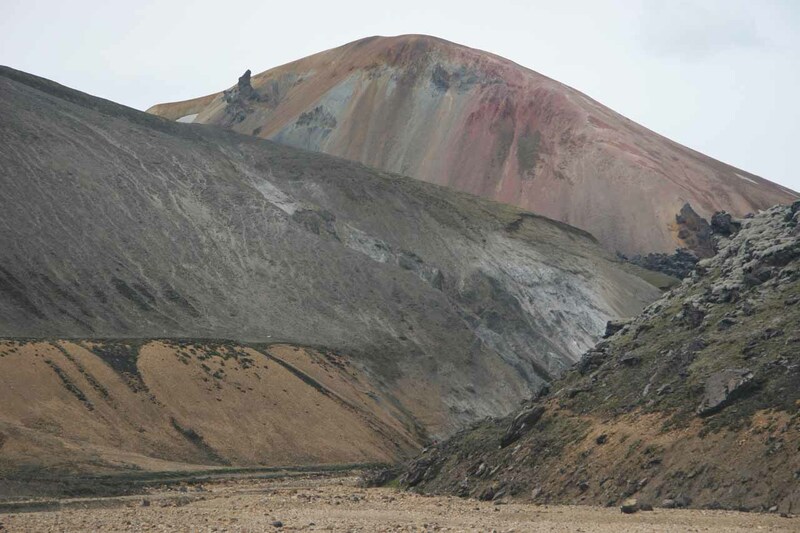 So we figured we’d get some decent photos of the landscape though not the blue skies and bright colors of the volcanic landscape the postcards would lead you to believe. The morning went by uneventfully. After parking our SUV at the N1 station in town, the bus arrived on time at 9am. Then, we paid the two-way fare for each of us, and we found a seat towards the back of the bus. The bus was literally a bus with big wheels and probably with some four-wheel drive capability. I didn’t think it was suitable for the mountain roads due to its size, but indeed this was going to be our ride. Then, the driver started off. 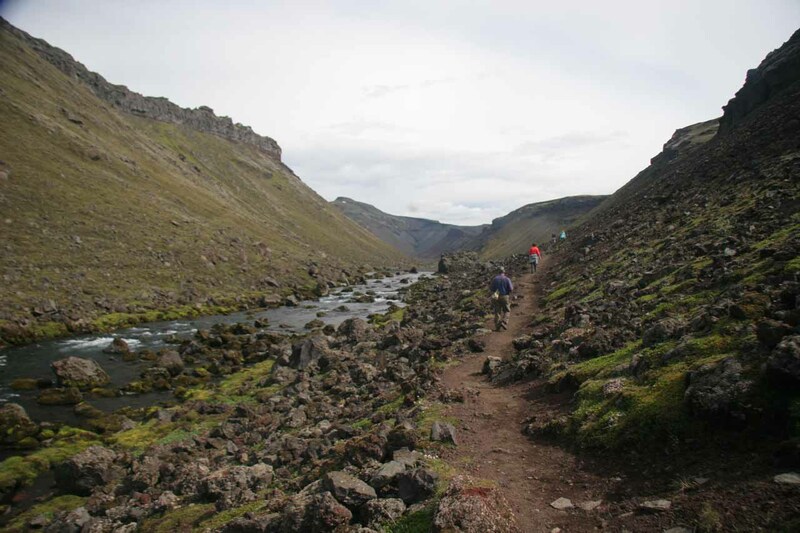 The whole time we were on the road, I was hoping that we got our money’s worth with rough roads and river crossings. I didn’t want this to be something where we could’ve driven on our own thereby saving time and possibly some money. At first, the road was indeed tame and the rivers were bridged. We stopped by some guesthouse near a big waterfall to pick up a few more passengers. The stop wasn’t really for us so we didn’t get a chance to see this waterfall. Oh well, we’ll have to do this one on our own. But the falls certainly looked pretty big. 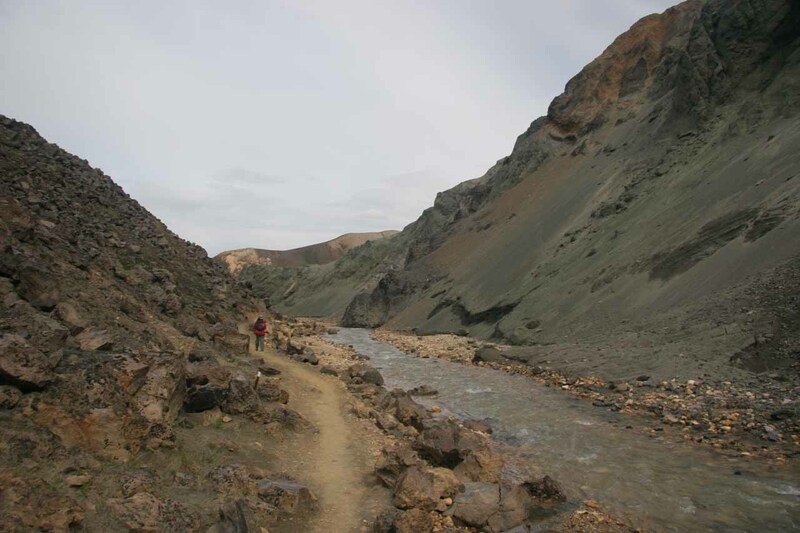 Anyhow, the tour continued and as the road got progressively rougher, we finally had our first river traverse. 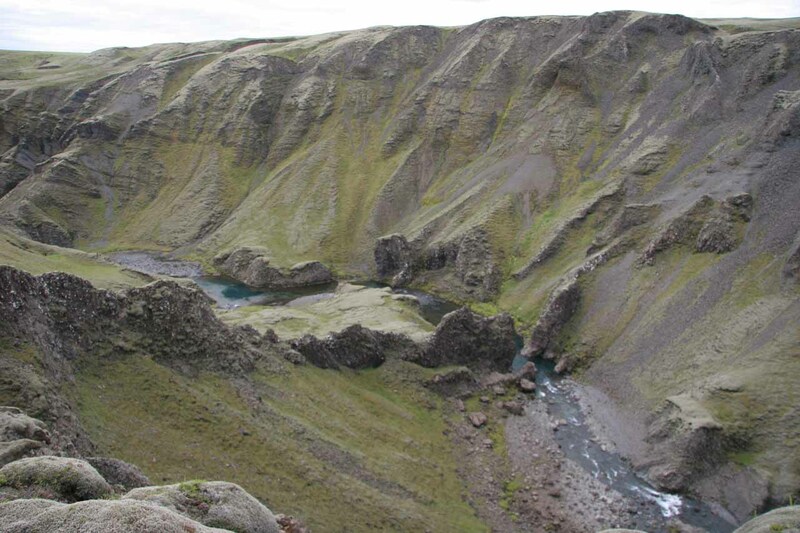 We’d eventually get to the Eldgjá chasm which was not too far from that river crossing. There was actually a car park with two footbridges to get through the river. 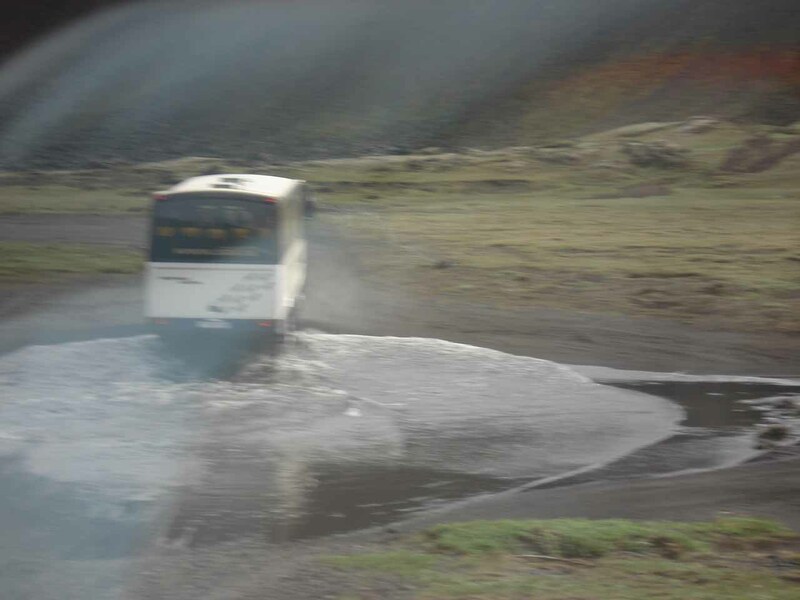 However, the bus splashed its way through these rivers and got to a closer car park. 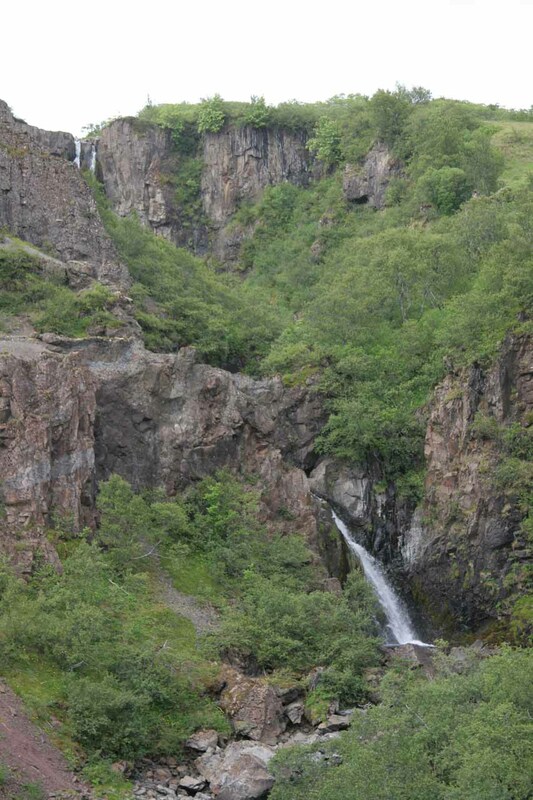 Once we arrived at the start of the walk to the Öfærufoss waterfall, we were given an hour on our own. It turned out that the hike to get to the falls and back was at least 45 minutes so there was hardly any time to get closer to the falls (though one guy did do that) for more photos. There used to be a natural bridge between the upper and lower tiers of the falls, but an earthquake knocked that bridge down. There was a guy we met on the bus who said he was here 20 years ago and actually stood ON that bridge! Anyways, the swarming midges made things a bit uncomfortable throughout the entire hike and at the waterfall. When it came time to leave, everyone beat a very hasty retreat back to the bus. I managed to get a bite on my arm so my theory that these midges don’t bite was incorrect. Even though the vast majority of them don’t bite, their bites were indeed itchy and irritating and definitely undermined my piece of mind while walking through their swarms without swatting at them. Next, the bus took off for Landmannalaugur and it quickly became apparent that we’d get our money’s worth (as far as whether we should’ve driven this route or not) after all. 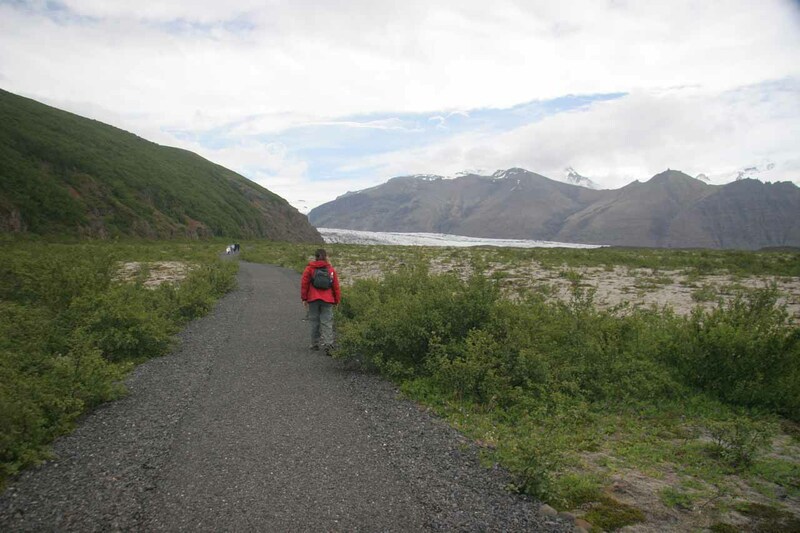 The road was very rough, narrow, and forded several rivers and creeks. I could only imagine how each of the obstacles would’ve been decision points for us to either keep going or turn back had we driven on our own. The terrain alternated between bare and dusty brown desolate deserts with some rivers weaving through such desolation at one moment. Then, we would find ourselves in a place where there would be mats of green (some very bright) matting some of the blackened terrain in a surprising display of color and contrast. The whole time we were out in this wilderness, I kept thinking to myself how difficult it a spot it would be if we were stuck from a vehicle breakdown or something. It might be a while before help arrives (though on a day like today, there were tours going and coming so perhaps it wouldn’t have been so bad). Still, it certainly would’ve sucked to be caught out here. I couldn’t imagine how bandits and outlaws were able to seek refuge in such harsh environments to escape the law and then return when memories faded and time has passed. Fortunately for us, the driver made a few photo stops along the way and he’d eventually get to Landmannalaugur at about 1:45pm which was nearly an hour behind schedule. Julie and I were shocked to see so many cars, tents, and even some buildings or structures in an area so remote and desolate. In fact, we even noticed some 2wd cars that were parked here indicating that it might have been possible to forego a tour had we come in from the west. Anyways, once we accepted the counterintuitive scene of civilization out in the middle of nowhere, we took our photos and then made good on our intentions to explore the area a bit. We’d only have until 2:45pm (it was barely 1:30pm) to explore the area so we hastily did so by taking photos but we didn’t get far enough to the thermal pools. Apparently, other tourists on the bus managed to see thermal pools next to the campsites, which were something Julie and I missed. I guess that was the give and take we had to weigh when it came to going on a tour or having the flexibility to get here on your own. 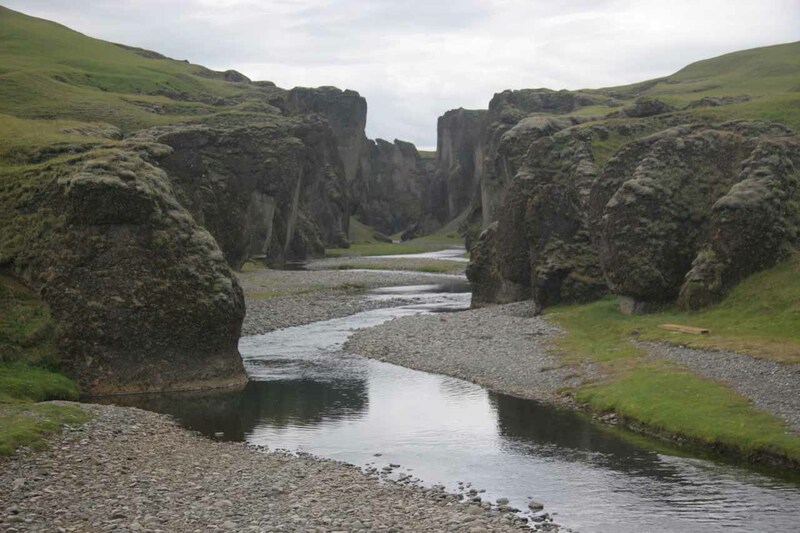 Anyways, we tempted fate by going pretty far from civilization as we followed a watercourse well into the colorful landscapes of Landmannalaugur. 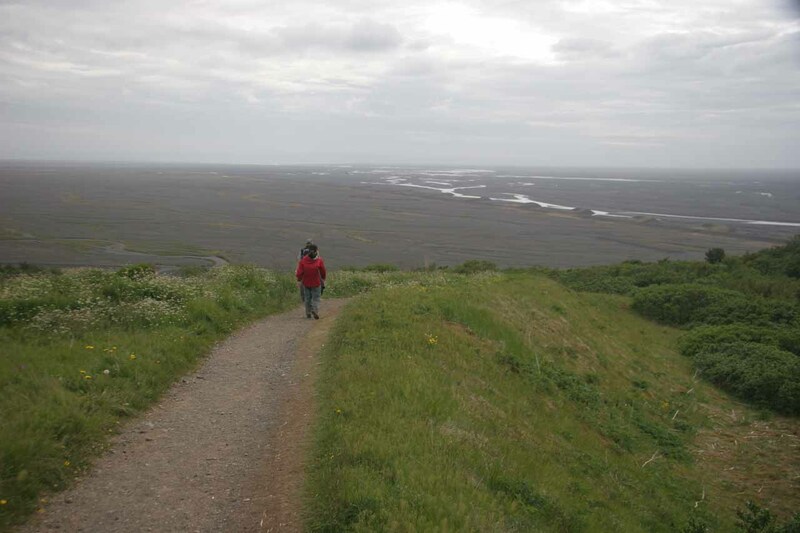 As we got further and further away, it seemed like the landscape kept teasing us and beckoning us to go further. It was just mindblowing to see reddish and orangish peaks and ridges surrounding us. But as much as we wanted to stay and explore for a bit longer, we begrudgingly had to beat a hasty retreat. And as promised, by 2:45pm, we got back to the bus and not long after, the driver proceeded to take us back to Kirkjubæjarklaustur. 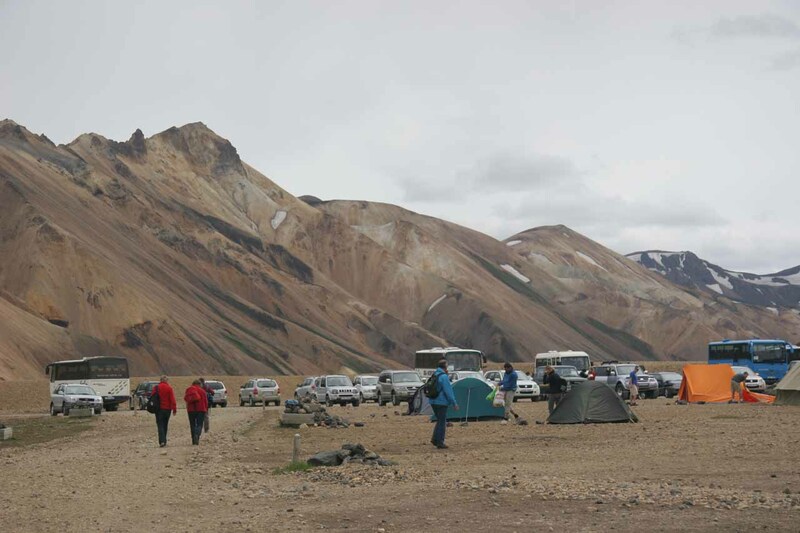 There were far fewer passengers on the way back than this morning as many of them opted to spend the night at the huts here, camp, or catch the connecting bus to Reykjavík. 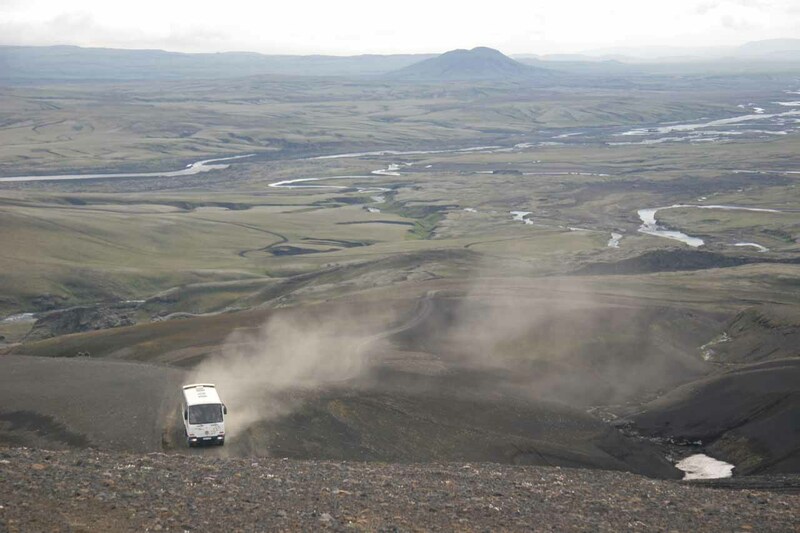 Actually, our driver proceeded to head back towards Eldgjá before finishing off at Klaustur. Julie and I had a little food coma from the snacks we ate at Landmannalaugur so we took brief naps. By the time I awoke, the clouds rolled in and I realized that we were going through fog! Some of the moonscapes we had to go through made it quite easy to lose the road if we weren’t paying attention. Quite scary! 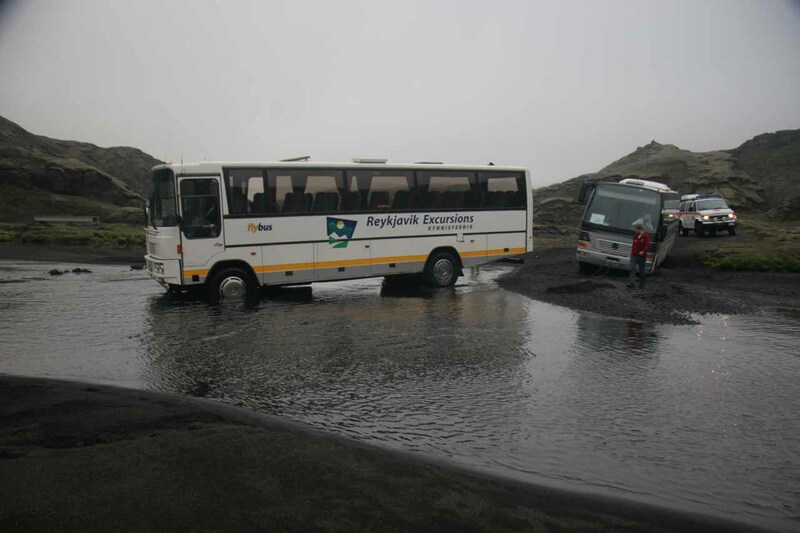 It wasn’t long thereafter that the driver returned to Eldgjá to make another stop there for those passengers coming from Reykjavík. During this stop, the driver (who didn’t speak much english) made some conversation with a Dutch couple with us listening in and partaking somewhat. The driver then noticed that the bus behind us was in trouble. 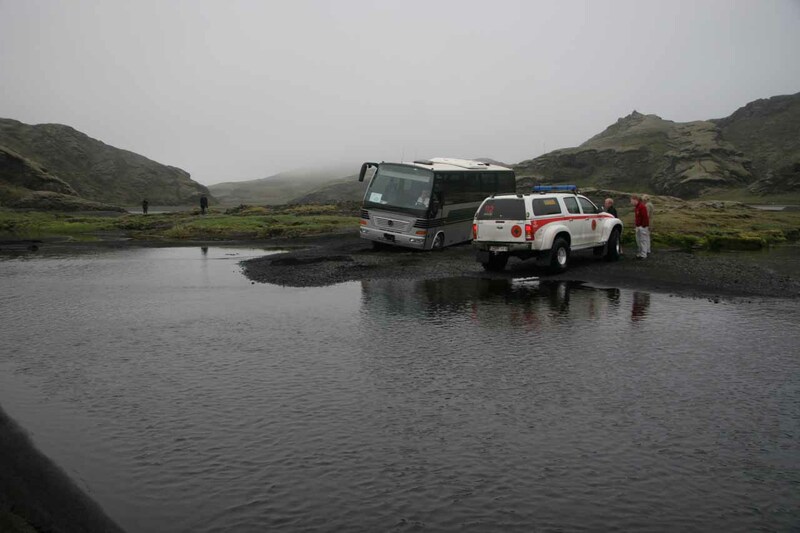 It turned out that the other bus was really stuck in the mud. Apparently, the other driver attempted to take a different line through the river and didn’t even make it to the river. By this time, passengers from both buses were watching like paying spectators. Our driver tried to help the other driver, who was a strikingly-dressed Madonna-lookalike female driver. However, he wasn’t successful with his attempt to pull her out of the mud. In the mean time, a pair of rescue trucks showed up and eventually managed to tow the stuck bus out of the mud. The incident was comical because drivers from both buses (including the Madonna-look-a-like that drove the stuck bus) took photos! It was almost like they couldn’t wait to show their friends or something what had transpired here. Anyways, with that bit of delay over with, we’d eventually make it back to Klaustur by 6:40pm. Time to take a shower and have a hearty dinner.